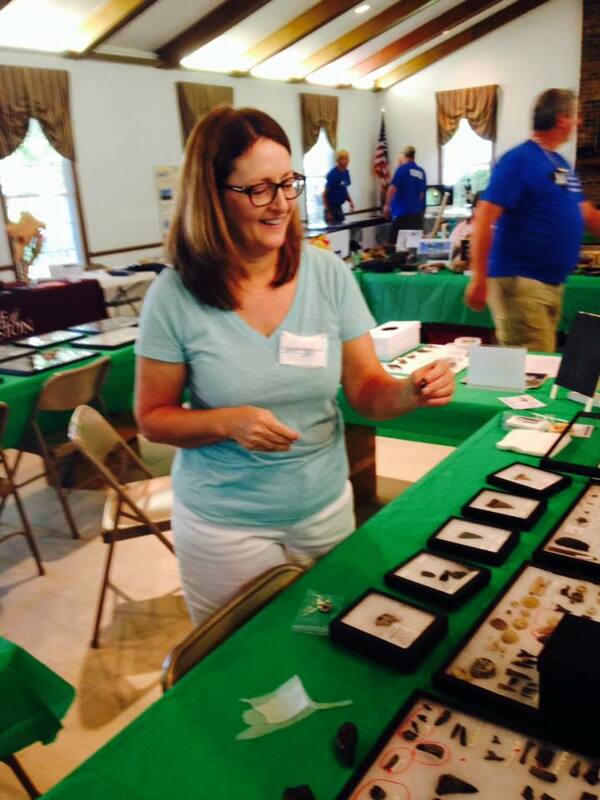 Friday Fossil Feature – What Makes a Fossil Hunter Happy? Finding His Porpoise! 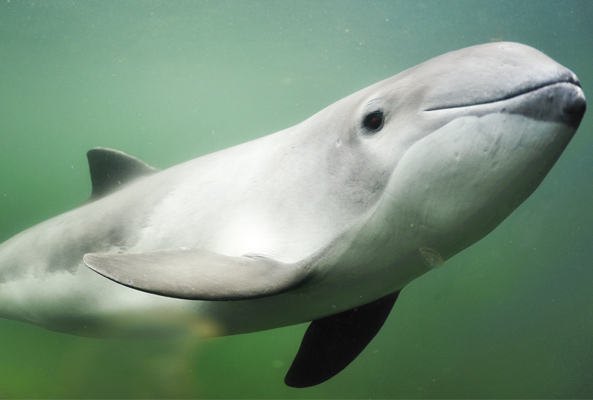 Porpoises belong to the modern family Phocoenidae, and are one of the less diverse ‘families’ of modern echolocating whales (Odontoceti), with six species in three genera. They are all typically quite small, and have a near worldwide distribution; the harbor porpoise itself (Phocoena phocoena) lives along most northern hemisphere coastlines in temperate latitudes; other porpoises have a more limited distribution, with some living in small embayments, like the critically endangered Vaquita (Phocoena sinus). Modern phocoenids have short snouts, and big lips for suction feeding; their teeth are quite distinctive and are spatulate rather than conical like most other odontocetes. Porpoises have a diverse fossil record, and extend back to the late Miocene of California and Japan; fossils indicate they were more diverse and disparate than they are today (disparity = ecological diversity). Phocoenids seem to be the dominant small odontocetes from upper Miocene and Pliocene deposits of California and Japan, with few examples of modern oceanic dolphins (Delphinidae), suggesting some significant and rapid faunal change between the Pliocene and modern day. Today, delphinids are the most diverse and numerically abundant small odontocetes in almost every ocean basin. In the latest Miocene and Pliocene of the North Pacific, however, there were delphinid-like porpoises with long snouts and approaching the size of bottlenose dolphins, as well as smaller harbor porpoise like species; and, of course, bizarre species like the ‘skimmer porpoise’ Semirostrum ceruttii (Racicot et al., 2014). Certain species may have been present in both California and Japan, in a specialized province with little communication with the North Atlantic or south Pacific (Boessenecker, 2013). The North Atlantic Pliocene odontocete record is mostly known from fossil assemblages from North Carolina, Belgium, and the Netherlands. These fossil assemblages are dominated by delphinids including many modern genera. Phocoenids, however, are rare, and known only from two specimens from the Pliocene of Belgium apparently belonging to different genera – Septemtriocetus bosselaersi, and Brabocetus gigaseorum (both named for the discoverers of each skull). These fossils post-date the opening of the Bering strait, and likely represent an early dispersal through the Arctic from the North Pacific, along with the extinct walrus Ontocetus emmonsi. However, no fossils of phocoenids have ever been discovered in the more richly sampled Pliocene deposits of the Atlantic coastal plain of North America. This includes the famous Yorktown Formation at the Lee Creek Mine in North Carolina, arguably the Pliocene marine fossil assemblage we know the most about worldwide; no porpoises at all (Whitmore and Kaltenbach, 2008). 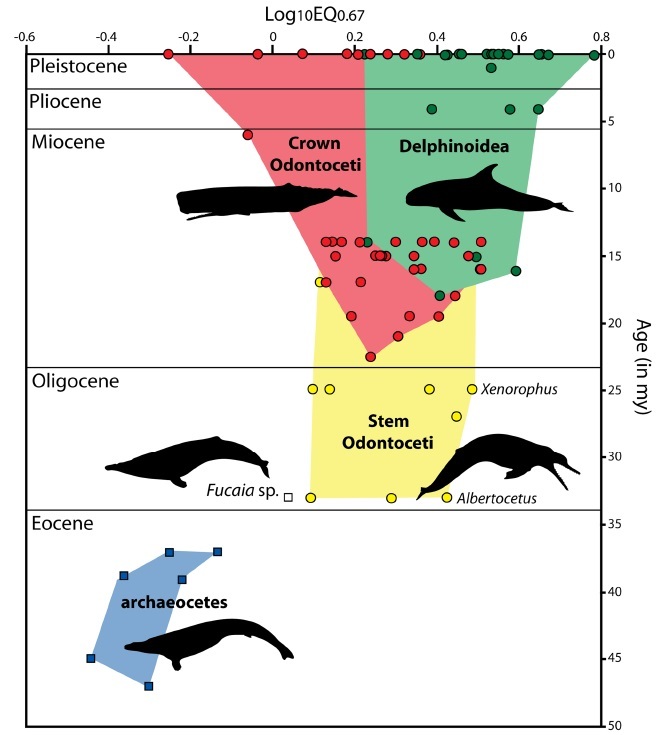 The Yorktown assemblage is dominated by ‘modernized’ cetaceans that inhabit the North Atlantic, whereas most of the cetaceans from Pliocene deposits in the North Pacific belong to extinct genera, families, or gener/families no longer inhabiting the North Pacific – again, indicating faunal endemism different from the modern fauna. Skull of the early Pliocene phocoenid Brabocetus from Belgium (from Colpaert et al., 2016). 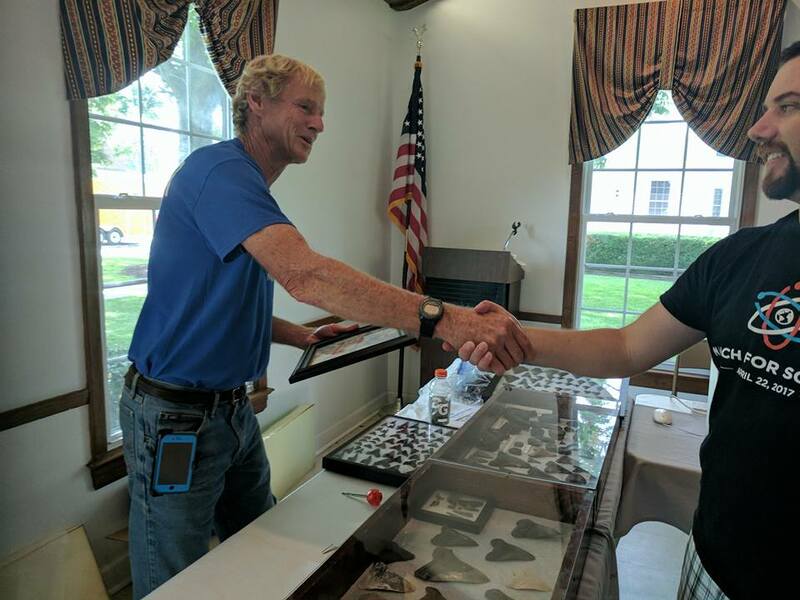 Recently, friend of the museum and donor Ashby Gale and his fossil tour clients (Ashby runs a local business taking visitors to publicly accessible fossil localities) discovered the first fossil phocoenid from the Western North Atlantic (to my knowledge). It is an isolated earbone collected from Folly Beach, South Carolina; the first was discovered last fall, and a second specimen was just found last week and generously donated by his client Don Pendergast. Ashby informs his clients of the scientific significance of the specimens they find and as a result many donations have been made to the museum (thanks!). Bedrock exposures do not exist anywhere on the barrier island; in fact, the fossil-bearing deposit is located offshore, and most of the fossils were accidentally dumped on the beach as part of a beach renourishment project where seafloor sand was added to the beach as a means to curb barrier island erosion; a slurry of seawater and sand is pumped from the shelf to the beach by means of a large pipe. 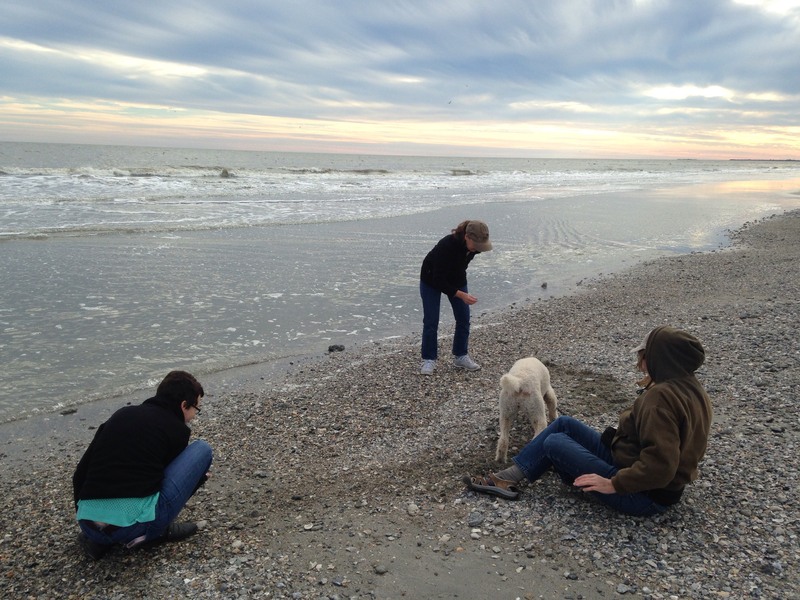 This was last done in 2014, and it introduced a ton of fossils and large sandy limestone blocks onto the beach; Folly Beach residents quickly became vocal about the rough debris. Fossil collectors rejoiced, however, as fossils may now be found quite regularly. Left periotic of a phocoenid porpoise, cf. Phocoena, from the ?Goose Creek Limestone, Folly Beach, South Carolina. So how old is this earbone? In particular, vertebrate fossils seem to arise from four sources. 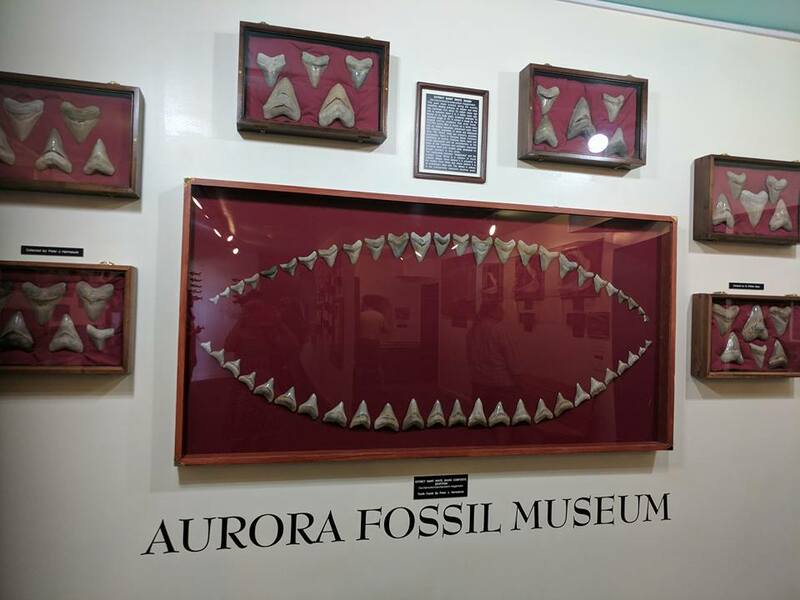 Shark teeth appear to represent Oligocene, early Miocene, and Pliocene assemblages, with certain extinct species reflecting each time period. These sources are probably the Ashley Formation (early Oligocene) which underlies most of the Charleston Embayment and produces rare Oligocene cetaceans and teeth of the megatooth shark chronospecies Carcharocles angustidens; the second is the lower Miocene Marks Head Formation, which produces rare sharks and marine mammals indicative of the late early Miocene (rugose teeth of archaic dolphins, earbones of early baleen whales like Parietobalaena, etc., the chronospecies Carcharocles chubutensis). The last, and most significant source, is the Pliocene Goose Creek Limestone; this unit produces most teeth including great white sharks (Carcharodon carcharias), the famous Carcharocles megalodon, and many marine mammals. Most dolphin earbones from Folly Beach either directly match species from the mostly contemporaneous Yorktown Formation. A younger unit is present, but is terrestrial and it yields abundant Pleistocene terrestrial vertebrates (turtles, horse, armadillos, etc. ); it is an unlikely source for the periotics discovered on Folly Beach. 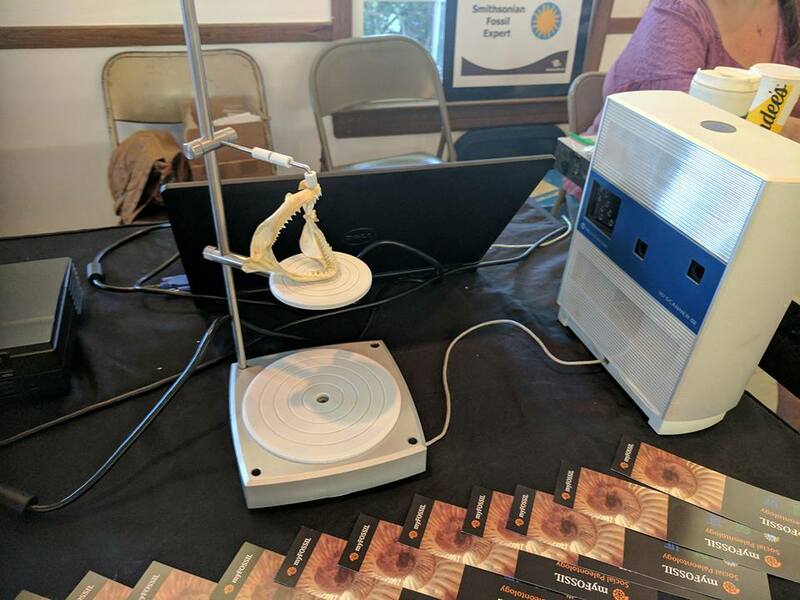 Ashby Gale’s discoveries are currently being worked on by CCNHM paleontologists, and one specimen is currently on loan to our colleague Dr. Rachel Racicot for CT scanning at Vanderbilt University. We hope to have these interesting (albeit fragmentary) records of porpoises published in the future! 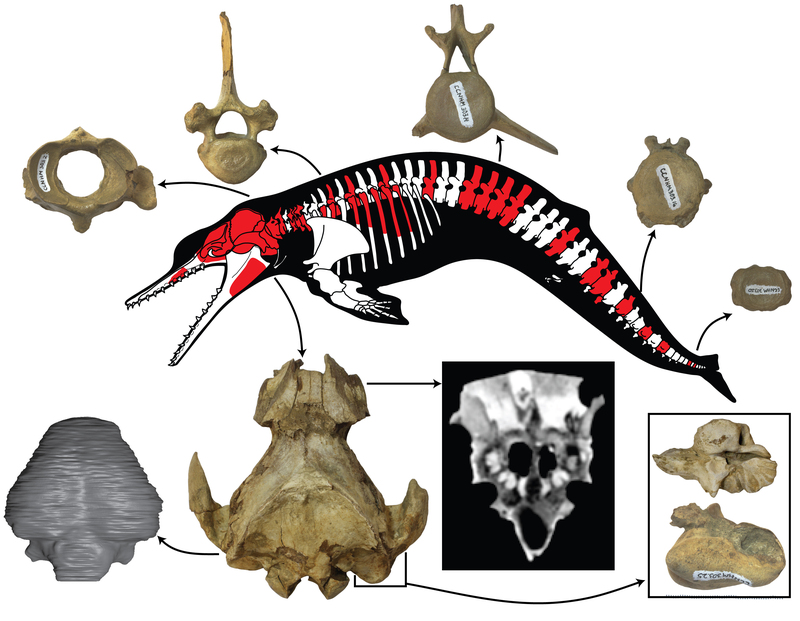 Earlier this week a new paper from CCNHM paleontologist Robert Boessenecker was published in the open access journal PLoS One, reporting new anatomical details for the extinct dolphin Albertocetus meffordorum. 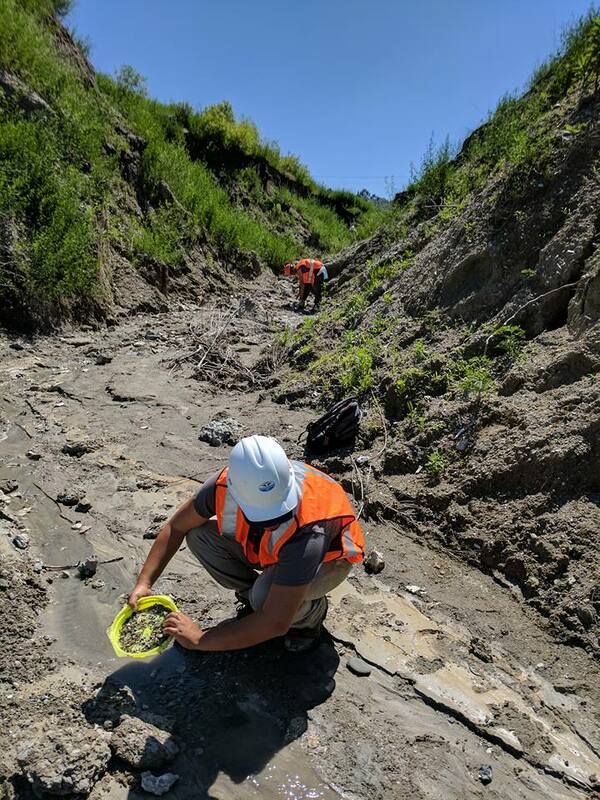 The paper was a collaboration between College of Charleston and the New York Institute of Technology, with scientific contributions from NYIT student Erum Ahmed and paleontologist Jonathan Geisler. The paper is open access, meaning that it can be read for free and downloaded directly from the PLoS One web page, here. The newly published material of Albertocetus meffordorum (shown in red) and map of where it was discovered. Albertocetus meffordorum was named quite recently (Uhen, 2008) and based on a single skull from the Belgrade Formation at Onslow Beach in North Carolina. The Belgrade Formation is late Oligocene in age, approximately 25-27 million years old (Ma). Albertocetus was the first xenorophid dolphin reported from outside the Charleston area in South Carolina. The xenorophids are a formerly poorly-known group of very early-diverging echolocating whales (Odontoceti). Originally reported in the 1930s by a partial skull, the xenorophids are now known to be a somewhat diverse group of dolphins including large fish-eating dolphins like Xenorophus sloanii, the earliest dolphins for which we have abundant evidence of echolocation – the somewhat smaller Cotylocara macei and Echovenator sandersi, and the tiniest cetacean to ever evolve, the ~1 meter long dwarf toothless short-snouted dolphin Inermorostrum xenops. Most xenorophids have a long, gharial-like snout with double-rooted teeth and pits in the snout and jaw for the teeth to interlock. Albertocetus was the first xenorophid to be described with a braincase and earbones – critically expanding the known anatomy of this group. Phylogenetic analyses have consistently placed xenorophids at the very base of the echolocating whales, though several groups were already contemporaries. Cranium of Albertocetus meffordorum. CCNHM 303 in (A) dorsal view; CCNHM 218 in (B) dorsal view; maxilla fragment of CCNHM 303 in (C) lateral, (D) ventral, and (E) medial view. Cross-hatching denotes damaged or missing bone. The new fossils described by Boessenecker et al. (2017) include a number of specimens from South Carolina and North Carolina. Two skulls from the lower Oligocene Ashley Formation (~28-30 Ma) near Charleston, South Carolina, preserve much of the same anatomy as the original ‘type specimen’ (a skull at the Smithsonian) but one of these is associated with a ~50% complete vertebral column and several ribs. This skeleton, collected by College of Charleston students in the 1990s, also has part of a mandible and an earbone that was removed from the skull (in the type specimen, the earbone is still embedded in the skull). The second skull was CT scanned and a digital endocast was studied – in other words, the internal surface of the braincase was reconstructed into a 3D model to examine the anatomy of the brain. The vertebral column includes a number of tail vertebrae, which are wider than would be expected for an odontocete. 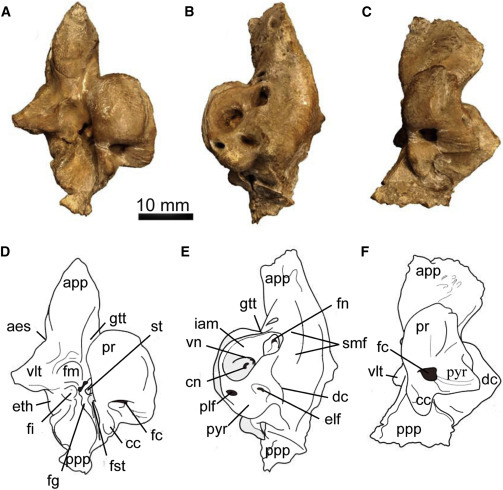 In modern cetaceans – both baleen whales and dolphins – these vertebrae are somewhat narrower than tall, corresponding to the narrow tail stock (caudal peduncle) seen in iconic photographs of whale tail flukes displayed whilst diving. This suggests that a narrow tail stock evolved independently within later odontocetes and baleen whales. 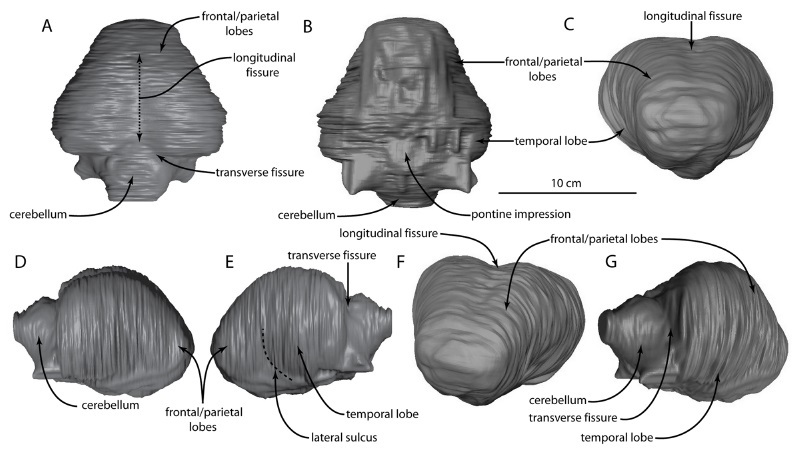 CT scans showing the brain endocast. 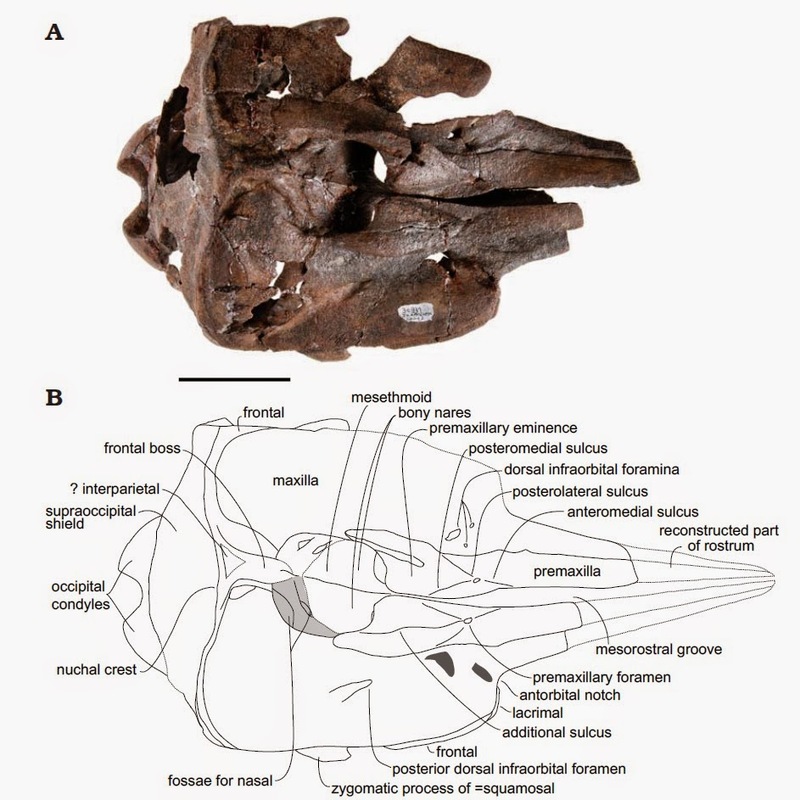 The brain endocast is interesting, as it is anatomically intermediate between the ancestors of modern whales, the Basilosauridae, and modern dolphins. The brain is still somewhat elongate and conical, and has enlarged temporal lobes and relatively small frontal and parietal lobes. In contrast, modern dolphins have greatly enlarged frontal and parietal lobes and proportionally smaller temporal lobes. This brain anatomy suggests that the large brains of the xenorophids evolved early, and perhaps in parallel with modern dolphins – becoming enlarged via a different pathway and using different parts of the brain for cognition. Because animals – particularly extinct ones – cannot be given IQ tests, the encephalization quotient (EQ) is used as a rough approximation of animal intelligence. It’s essentially a ratio of brain mass to body mass. In this study, the brain volume of Albertocetus was carefully calculated and body mass estimated based off of skull size using equations developed for other cetaceans. Because a large mass of venous tissue is present along the sides and bottom of the brain of cetaceans, a correcting factor was also used to estimate how much volume was actually brain matter versus venous tissue – neither fossilizes and both soft tissues occupy the same space in the skull. 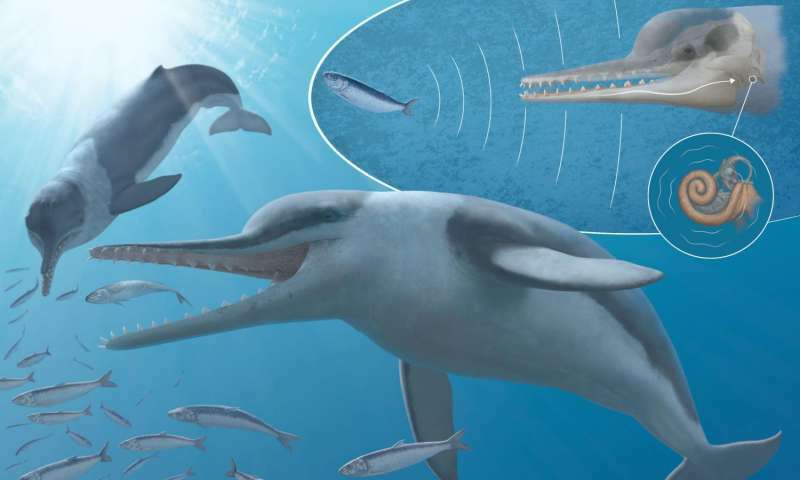 Even still, Albertocetus was found to have the highest EQ for any early Oligocene cetacean – surpassed in the late Oligocene by a new, undescribed species of its’ bigger cousin Xenorophus, and by more modernized dolphins in the Miocene and Pliocene. This highlights a rapid increase in brain size across the Eocene-Oligocene boundary – archaeocetes ancestors were not exactly packing supercomputers upstairs. What caused this rapid increase in brain size? Some flawed studies have suggested that global cooling at this time caused odontocete brains to increase in size as brains produce heat (thermogenesis) and it helped with odontocete body temperature regulation in cooling climates (Manger, 2006). However, there are numerous problems with this study, which has been largely discredited by a large team of experts on dolphin cognition and evolution (Marino et al., 2008). For example – why didn’t baleen whales show a similar increase in brain size across the boundary? Rather than using brains for thermogenesis, the earliest odontocetes were echolocators like Echovenator sandersi (Churchill et al., 2016). Large brains are necessary for complex cognition, and echolocation takes a lot of brain power. Albertocetus was another xenorophid with the same facial and basicranial features indicative of echolocation. Boessenecker et al. (2017) reiterate the conclusions of earlier work that brain size exploded as echolocation evolved – a ‘key innovation’ in the evolution of the odontocetes. The study of fossil whales and dolphins is often plagued by overemphasis on single specimens: rather than describing a suite of fossils when reporting a new species, only a single fossil is often reported, even if others are known in museum collections. This new study reported multiple new specimens including a skeleton, a skull, and isolated earbones – drastically expanding the known anatomy of Albertocetus as well as providing new information on individual and growth related variation in early odontocetes. 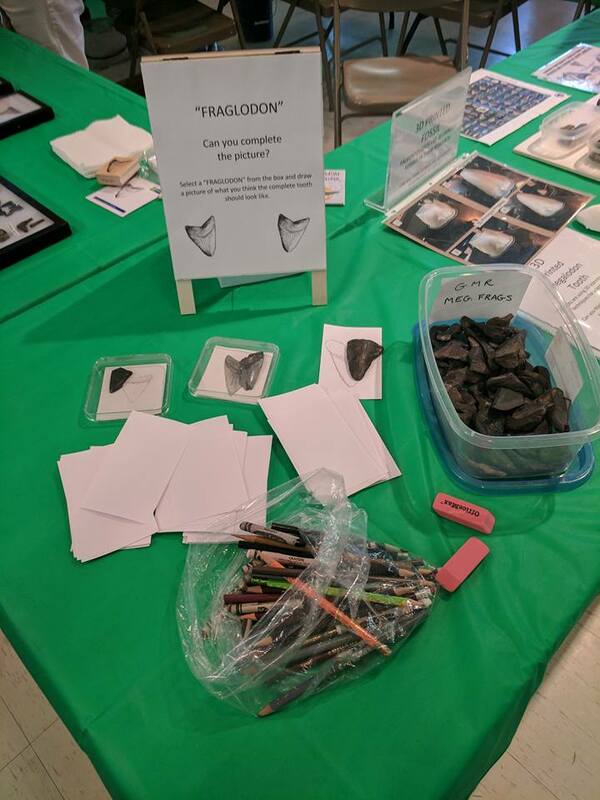 Most of these specimens were all collected by amateur collectors, and we would know none of this if paleontologists had not worked with amateur fossil collectors. This new scientific study highlights the importance of embracing larger sample sizes and, most critically, working with amateur fossil collectors to study fossils. Dr. Boessenecker did an interview with PLOS that you can read here. Life restoration of Coronodon havensteini. Illustration by Alberto Collareta. Last week saw the publication of a new paper naming our spectacularly preserved toothed baleen whale Coronodon havensteini. The article was published in Current Biology by Jonathan Geisler and Brian Beatty from NYIT, CCNHM donor and namesake Mace Brown, and of course one of our own paleontologists, Robert Boessenecker. The paper has been in the works for years and we are elated, if not relieved, that it is finally published. This blog post will consider some of the highlights of the paper, but first – a little back story is needed. 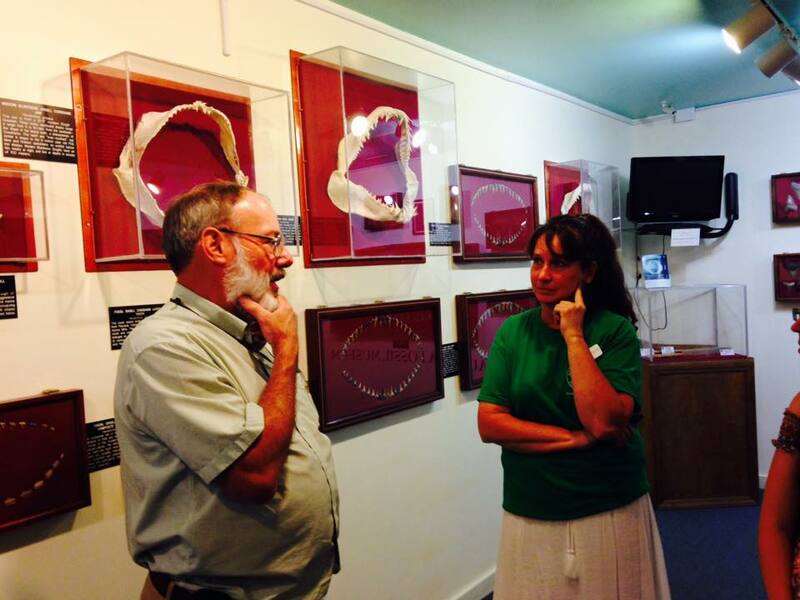 CCNHM paleontologist Dr. Robert Boessenecker explaining dental filtration in Coronodon at the Mace Brown Museum of Natural History. Photo by Post and Courier. Modern baleen whales (Mysticeti) are filter feeders, and do not have adult teeth. They do, however, form teeth as embryos which are then quickly resorbed – this in itself is not surprising as having teeth is the primitive condition for mammals. 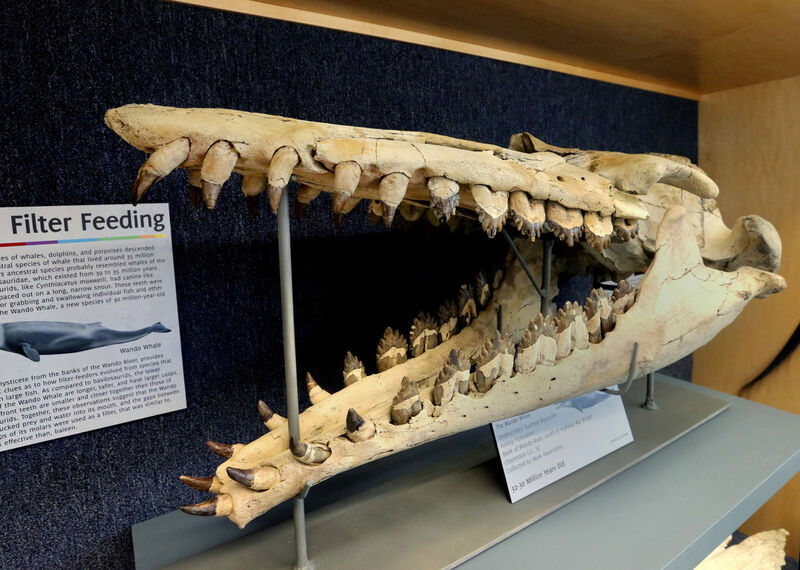 Instead, as adults, baleen whales possess racks of baleen that hangs from the upper jaw – a highly specialized type of gingival (gum) soft tissue that is made of keratin and is essentially the same type of tissue that makes up horn, fingernail, hooves, etc. Because it is a soft tissue, it typically does not fossilize (though some rare examples definitely exist), and just like fingernails, grows continuously during life (and length is maintained by the tongue rasping away at the inside). Modern baleen whales feed in three ways: gulping large volumes of water after schools of krill and fish while swimming at high speed (humpback/blue whales – rorquals), sucking up sediment filled with tiny burrowing crustaceans (gray whales), and cruising slowly though “clouds” of tiny copepods with the mouth open (right/bowhead whales). 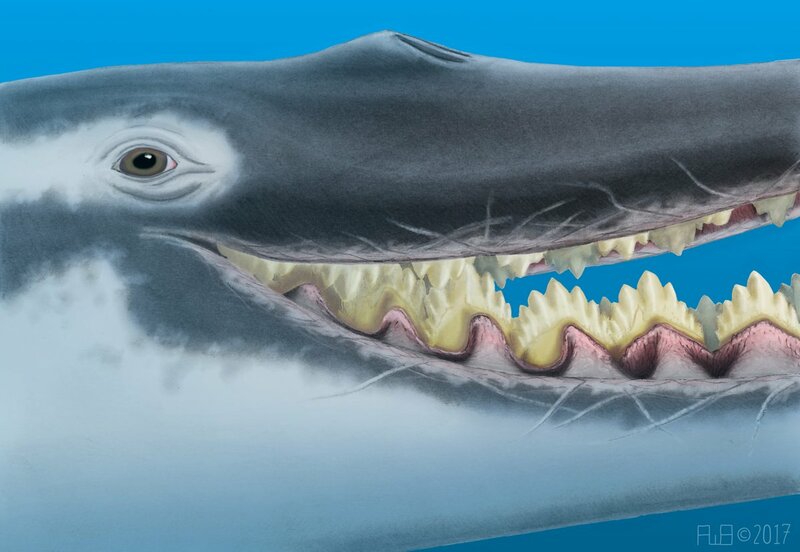 Given that modern baleen whales lack adult teeth, and all species in the other group of cetaceans – the echolocating whales, or Odontoceti – possess teeth (given their more common, yet evolutionarily misleading name, the “toothed whales”) have teeth – we should expect a baleen whale ancestor with teeth. Aetiocetus weltoni with teeth and baleen as proposed by Deméré et al. (2008), and a blue whale filter feeding. Artwork by Carl Buell. A few confusing fossils were reported in the late 1960s from the Pacific Northwest, originally interpreted as archaeocetes given the relatively primitive shape of the skull and, in one case, retention of teeth. One of these was collected, prepared, and published by legendary fossil collector Douglas Emlong – and named Aetiocetus cotylalveus. It was later recognized as an baleen whale, and in the 1990s, a number of additional fossils revealed that there was an entire diverse family of aetiocetids in the North Pacific, now known from Japan, British Columbia, Washington, Oregon, California, and Baja California. Other advances in the last fifteen years included the discovery of additional aetiocetids, the discovery of the bizarre toothed mysticete Janjucetus from Australia, and the redescription of another former archaeocete, Mammalodon (closely related to Janjucetus). A critical scientific advance was the detection of palatal foramina in the toothed mysticete Aetiocetus weltoni (Deméré et al., 2008) – these are holes that transmit blood vessels to “feed” baleen, and are enlarged in all modern baleen whales and all extinct baleen whales that lack teeth, and are thus a bony correlate indicating the presence of baleen. This landmark paper proposed a “stepwise” transition from teeth to baleen in the Mysticeti: a tooth-only stage (e.g. Janjucetus), a stage including teeth and baleen at the same time (Aetiocetus weltoni), followed by loss of the teeth (modern baleen whales). 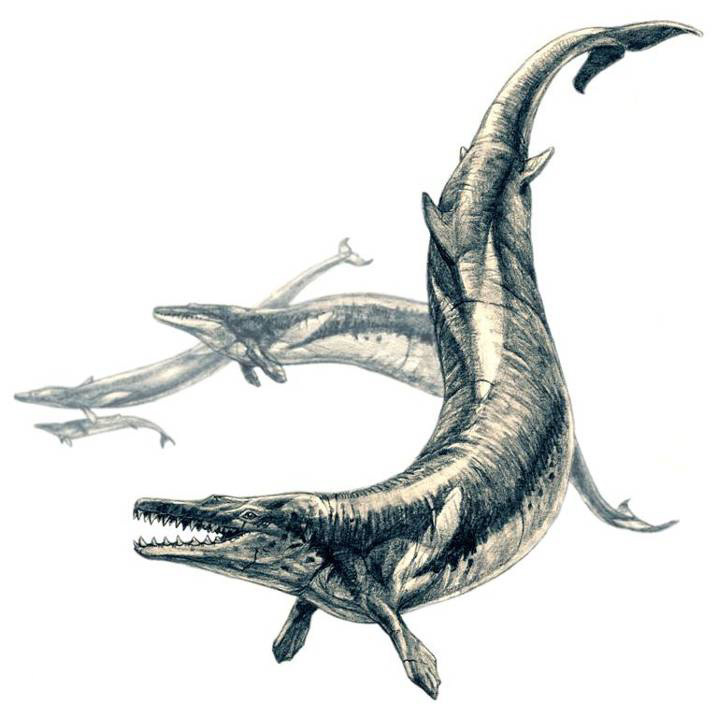 Some eomysticetid whales – higher up the tree than the aetiocetids, and formerly considered to be toothless – had baleen along most of the palate, with a few vestigial “buck-teeth” in the front of the jaws, revealing a fourth stage between aetiocetids and modern mysticetes (Boessenecker and Fordyce (2015). The palate of Aetiocetus showing palatal foramina and modern baleen whales. From Ekdale et al. (2015). This study has drawn substantial criticism, with certain papers pointing out that the foramina are of uncertain origin, or perhaps too small to infer the presence of baleen. A recent study (Marx et al., 2016) showed a unique pattern of tooth wear on an aetiocetid lovingly nicknamed “Alfred” where the base of the crowns were in pristine condition but the tips of the teeth were worn and scratched – they proposed that the pristine crown was covered in enlarged gums (gums do not typically cover tooth enamel in most healthy mammals). These researchers hypothesized that aetiocetids simply had enlarged gums rather than baleen – and palatal foramina would supply blood to the thickened gums instead, as an intermediate condition between “teeth only” and “baleen only”. Another recent hypothesis is that because modern suction feeding odontocetes have reduced teeth, a hypothetical toothless and baleen-less intermediate may have been possible (Peredo et al., 2017). 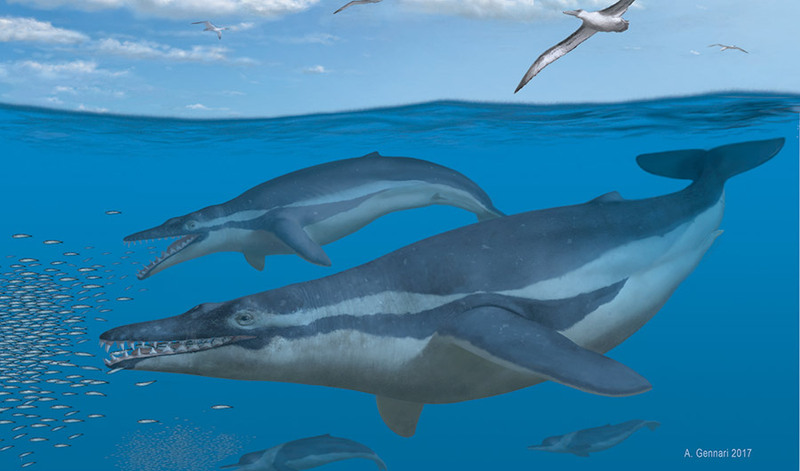 A very recent paper reported a very early baleen whale (Mystacodon selenensis) with teeth and possible suction feeding habits (Lambert et al., 2017). Revised model of baleen evolution, from Marx et al. (2016). Coronodon havensteini sheds new light on this debate. The holotype specimen (a holotype is the specimen which a new species is based on) is CCNHM-108, and is a large (~1 meter long) skull with mandibles, many of the teeth, earbones, cervical and thoracic vertebrae, and a bunch of ribs. Other specimens that may belong to this species are curated at Charleston Museum and have been known about since the 1980s but never formally published. CCNHM-108 is the most complete of the infamous “Charleston toothed mysticetes”, and was collected by licensed diver Mark Havenstein from the Ashley Formation in the Wando River in the early 2000s – the species name is in honor of Mark’s discovery. The genus name refers to the beautiful crown-shaped cheek teeth. 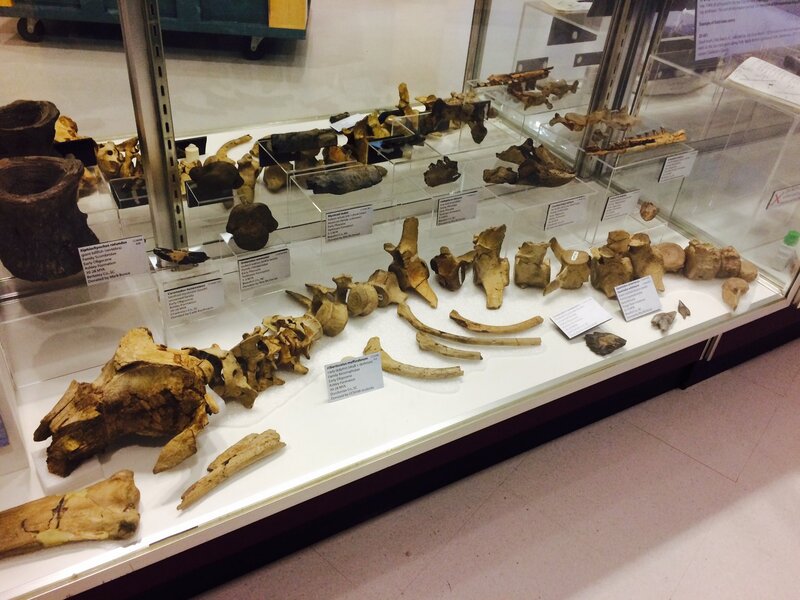 The specimen was donated to CCNHM shortly after its founding, and was placed on display in the whale room in 2014. The holotype skull (CCNHM 108) of Coronodon havensteini. The skull and dentition bear a number of striking resemblances to basilosaurid whales – the common ancestors of the odontocetes and mysticetes, and Coronodon would have thus greatly resembled a basilosaurid in many respects. Basilosaurids have an external nose far out on the rostrum and a series of denticulate shearing teeth, the largest being in the third and fourth premolars – the molars are smaller, with wear patterns indicative of sharing and in some perhaps a degree of crushing as well. Overall having bite force emphasized on the posterior premolars is reminiscent of mammalian carnivores like dogs. The rostrum, like most mammals, is tightly sutured together. Coronodon differs in several ways from the basilosaurid condition: 1) the rostrum is wider and somewhat flattened, a bit like modern baleen whales; 2) the blowhole is positioned further back, just in front of the eye sockets; 3) the bones of the snout are only lightly connected, permitting some flexibility of the rostrum, correlated with filter feeding (but the mechanism is still unknown); 4) the cheek teeth in the lower jaw (p2, p3, p4, m1, m2, m3) are all nearly the same size and shape (upper teeth are more scarcely known) – indicating that the molars have increased in size from basilosaurids; 5) the teeth overlap and have slots between them which water can pass through. Coronodon also exhibits some features of the basicranium that are unique to baleen whales, confirming it as an early transitional toothed baleen whale. Critically, Coronodon lacks palatal foramina – indicating the absence of baleen. 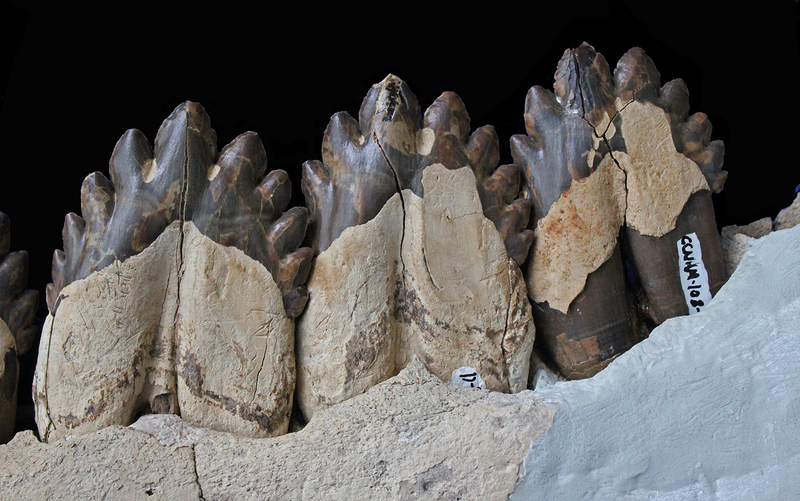 It does, however, exhibit widespread enamel and dentine erosion on its teeth, indicating that much of the exposed roots and part of the enamel crown were covered by enlarged gums – as proposed for the aetiocetid “Alfred”, and confirmed here using evidence of periodontal disease, which appeared to be the norm for Coronodon as all specimens share some evidence of dental erosion. The cheek teeth of Coronodon. The skull, teeth, and jaw of Coronodon. From Geisler et al. (2017). These features all indicate that, despite certain features resembling archaeocetes, Coronodon was a baleen whale. The teeth, unlike basilosaurids, interlock in a way that formed a toothy “cage”; interdental slots permitted water to pass through, but not small prey. If the jaws were partially opened, diamond-shaped holes would be present between the upper and lower teeth, meaning that by changing how far open the mouth was, the filter feeding ‘size’ could be adjusted – making for a dynamic filter feeding device. Modern leopard and crabeater seals filter feed for krill and small fish – leopard seals seemingly rip penguin heads off only a few months of the year, and filter feed for most of it. They do not chew with their cheek teeth, and just nip with their canines and incisors – so tooth wear accumulates only on the teeth in the front of the jaw (Hocking et al., 2014). In Coronodon, we see the same pattern: tooth wear on the front teeth, and minimal tooth wear on the denticulate cheek teeth – which is very different from basilosaurids, despite dental similarities. This indicates that, like leopard seals, Coronodon avoided chewing hard prey with its cheek teeth, likely to preserve the shape of the dental filter. Life restoration of Coronodon showing the mouth – it would have probably looked quite disgusting. Watercolor by Robert Boessenecker. So what does this all mean? Recent hypotheses have suggested that toothed mysticetes were suction feeders and did not filter feed, with true filter feeding occurring within the eomysticetid whales and further up the tree, with enlarged gums acting as a way to make a better oral “seal”, much like the enormous lips of a beluga or pilot whale. Aetiocetids occur farther up the tree than Coronodon – indicating that tooth-based filter feeding began very early in baleen whale evolution, suggesting that aetiocetids may have been too specialized on their own branch to weigh in on how baleen evolved. After all, functionally toothless baleen-bearing eomysticetid whales appear at the same time as the toothed aetiocetids. 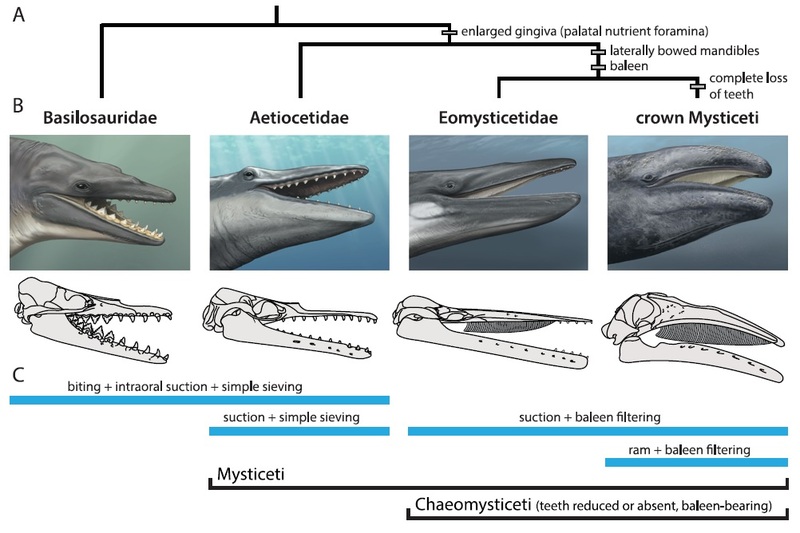 Filter feeding – whether with baleen or teeth – thus appears to be intimately linked with the earliest baleen whales, and perhaps the mammalodontids and aetiocetids reverted to earlier forms of feeding (e.g. fish eating) and experimented with their own feeding styles (suction feeding). The skull of Coronodon on display at CCNHM. Come visit soon! This is only the tip of the iceberg on Coronodon and other Coronodon-like whales; additional specimens of Coronodon exist in our collection here at CCNHM and at Charleston Museum, and there is a second possible genus known from two skulls, one at each museum – currently under study by Geisler, Beatty, and Boessenecker. Problematic teeth of a Coronodon-like whale have been found in the depths of the Lee Creek Mine in North Carolina. 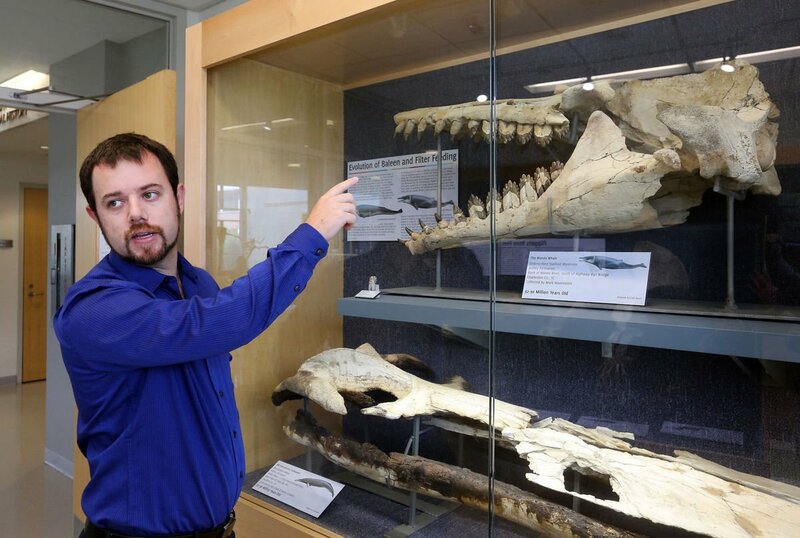 Stay posted for more whale news from CCNHM, and come visit and see the Coronodon holotype, on display! W. Boessenecker and R. E. Fordyce. 2015. A new genus and species of eomysticetid (Cetacea: Mysticeti) and a reinterpretation of ‘Mauicetus’ lophocephalus Marples, 1956: Transitional baleen whales from the upper Oligocene of New Zealand. Zoological Journal of the Linnean Society 175:607-660. A. Deméré, A. Berta, and J. Gatesy. 2008. Morphological and molecular evidence for a stepwise evolutionary transition from teeth to baleen in mysticete whales. Systematic Biology 57:15-37. E.G. Ekdale, T. A. Deméré and A. Berta. 2015. 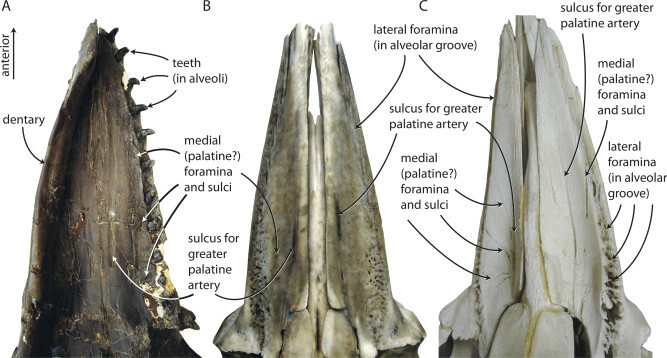 Vascularization of the gray whale palate (Cetacea, Mysticeti, Eschrichtius robustus): soft tissue evidence for an alveolar source of blood to baleen. Hocking, D.P., A.R. Evans, and E.M.G. Fitzgerald. 2013. Leopard seals (Hydrurga leptonyx) use suction and filter feeding when hunting small prey underwater. Polar Biology 36:211-222. Huge attendance for this year’s SeAVP! 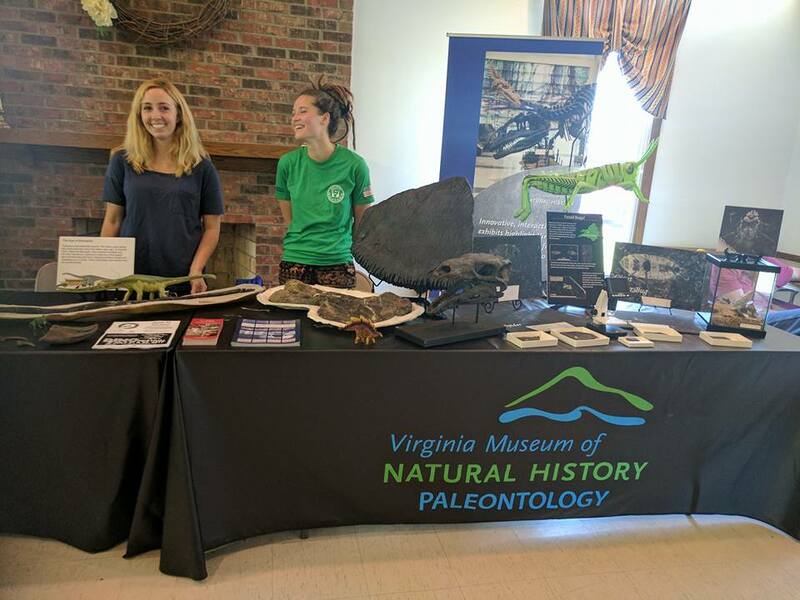 Last week, museum staff and volunteers traveled to Gray, Tennessee for the 10th annual Southeastern Association of Vertebrate Paleontology. What’s in Gray, Tennessee? 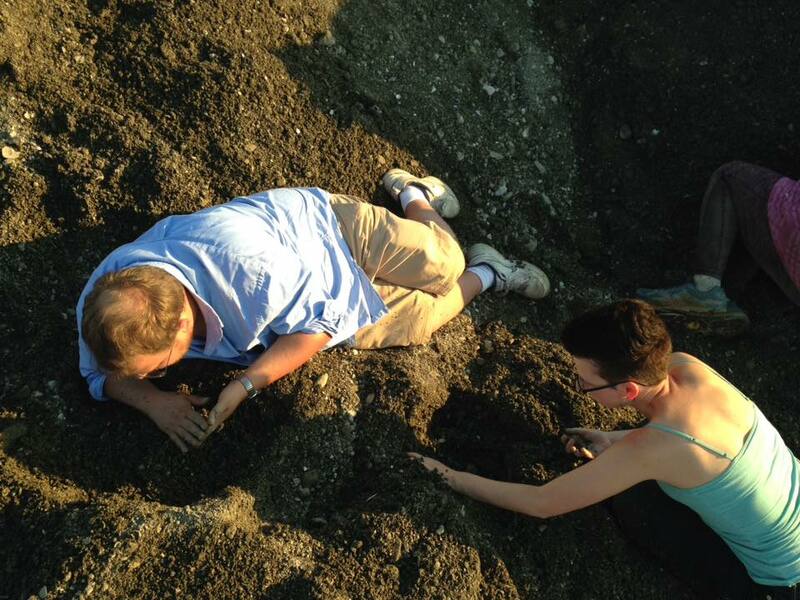 Why, the Gray Fossil Site, of course! The Gray Fossil Site (GFS) is a Miocene age site known for it’s spectacular preservation of fossils dating back 7 to 4.5 million years ago. GFS was discovered in 2000 while trying to expand the highway in the area; upon realizing the magnitude and importance of such a fossil site, the highway was rerouted to go around and construction began on a museum to house and educate about the wonderful finds coming from this prehistoric sinkhole. Lizards, snakes, turtles, and alligators are all commonly found at this site, as well as tapirs, saber-toothed cats, mastodon, and short-faced bear. GFS is also known for the most complete skeleton of the ancient barrel-chested rhinoceros Teleoceras and the most complete skeletons of red panda! Partnered with East Tennessee State University, GFS was the host of SeAVP this year; 10 years ago they started this small conference as a way to share new research and catch up with old friends, as well as providing a platform for new researchers to present in a smaller setting before moving onto larger conference settings. 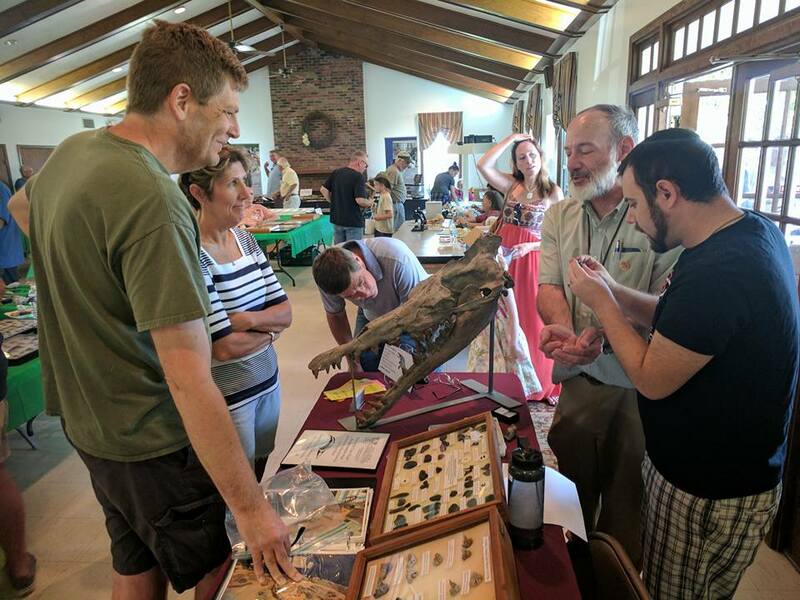 Professor Robert Boessenecker presented a 20 minute talk on xenorophids (Oligocene odontocetes) and Collections Manager presented a poster on a new record of the walrus Ontocetus emmonsi from South Carolina. Enjoy the following slideshow of pictures from the trip! 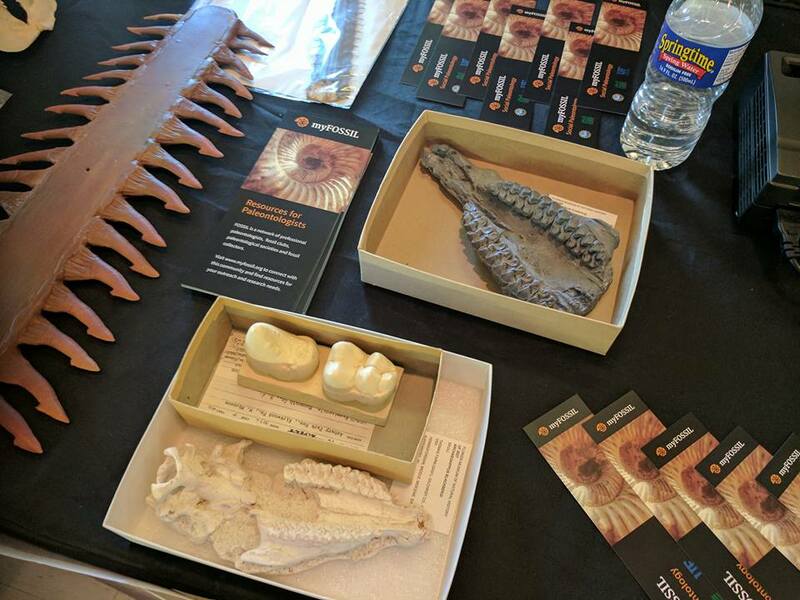 Friday Fossil Feature – 2017 Aurora Fossil Fest! 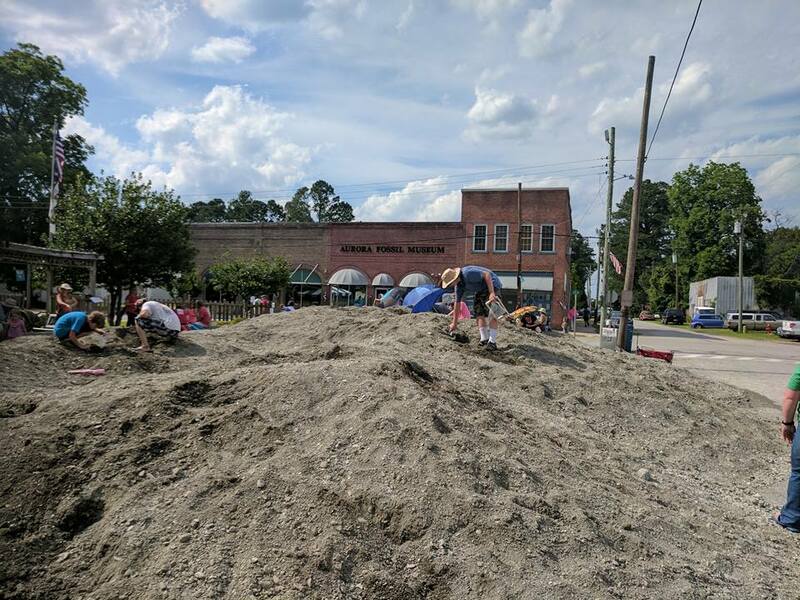 Over Memorial Day weekend, museum paleontologists Bobby and Sarah Boessenecker traveled to the town of Aurora, North Carolina for the 24th annual Aurora Fossil Festival. 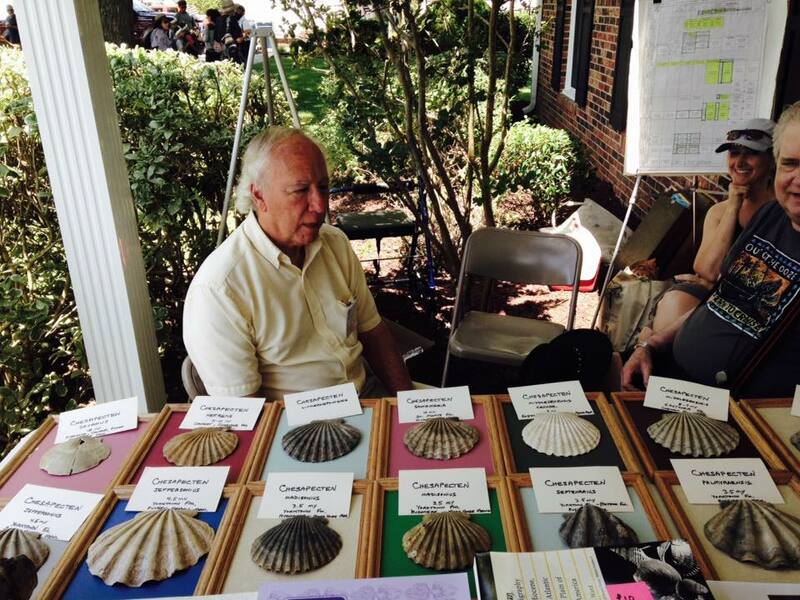 Aurora is tiny – roughly 500 people live in this small town right along the Pamlico River, and each year it grows to 15,000+ people for a weekend for the love of fossils and fossil-nuts alike! 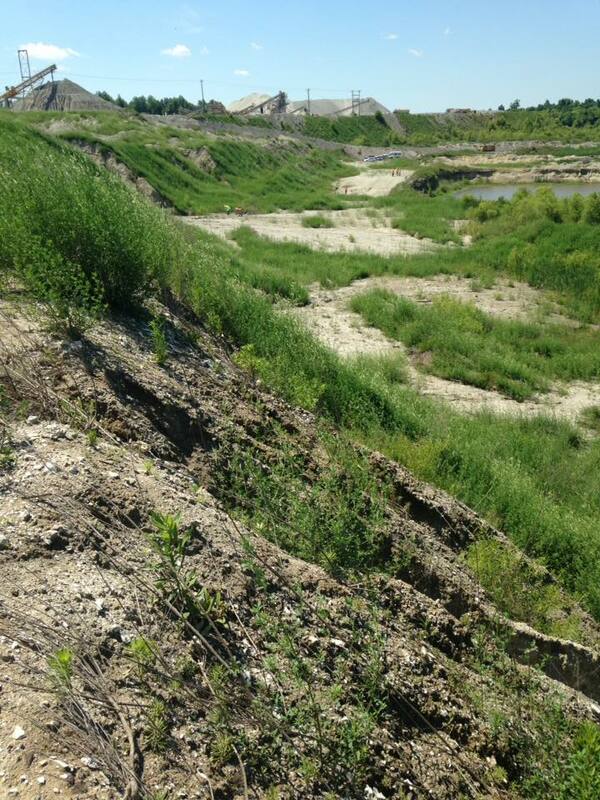 The trip started with a special visit to Belgrade Quarry to hunt for fossils. 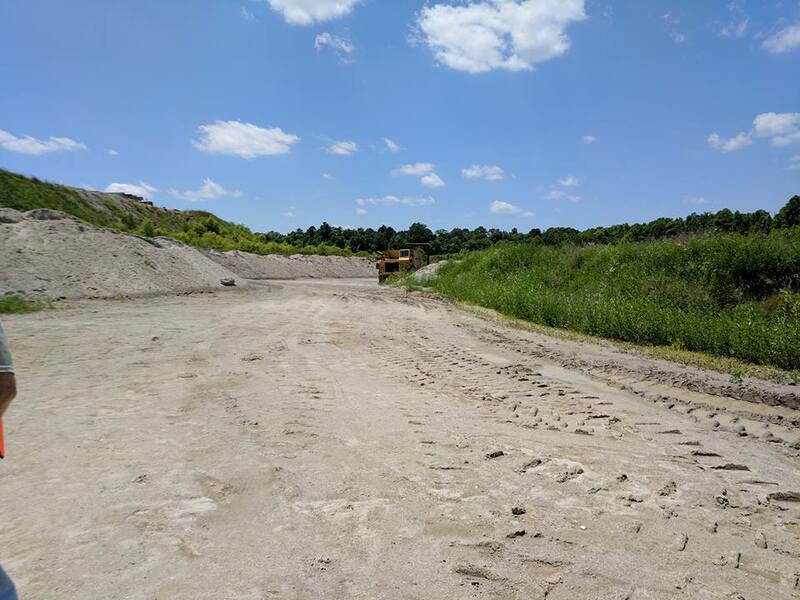 Belgrade Quarry is an open-pit aggregate mine – aggregate is one of the raw materials (typically limestone) used for concrete and road metal. 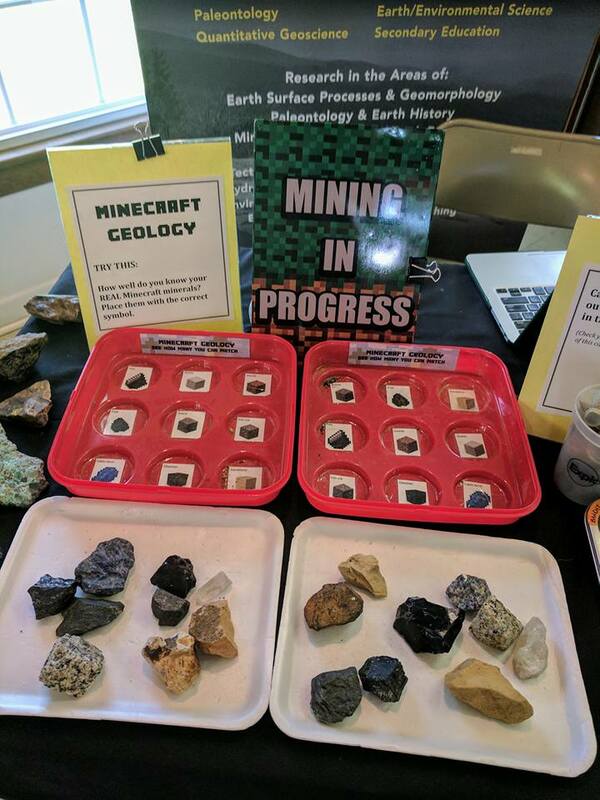 The mine is owned by the Martin Marietta Corporation, and while closed to the public for collecting, they graciously allow the North Carolina Fossil Club and their friends in once a quarter for collecting, and for special events such as the Fossil Festival. 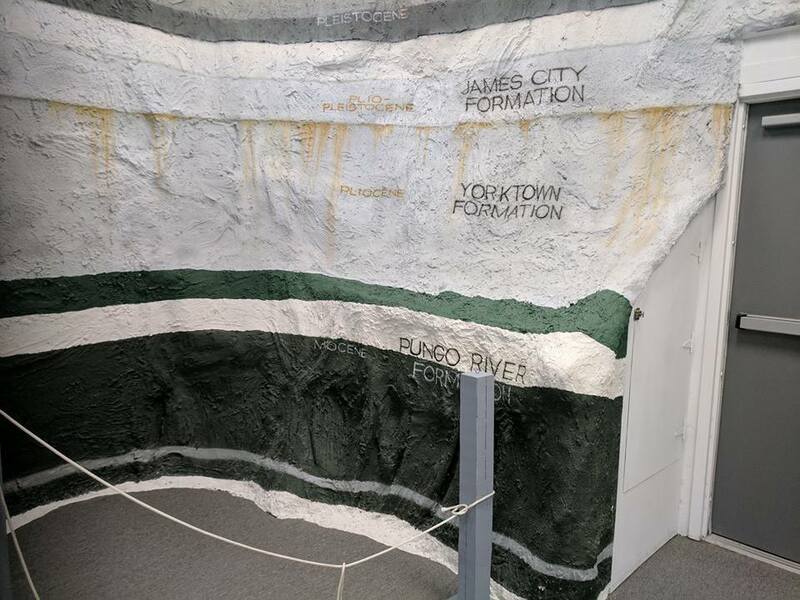 The mine exposes rocks from several different units: the Eocene Castle Hayne Limestone, the Oligocene Belgrade/River Bend Formations, and the Pliocene Duplin Formation. 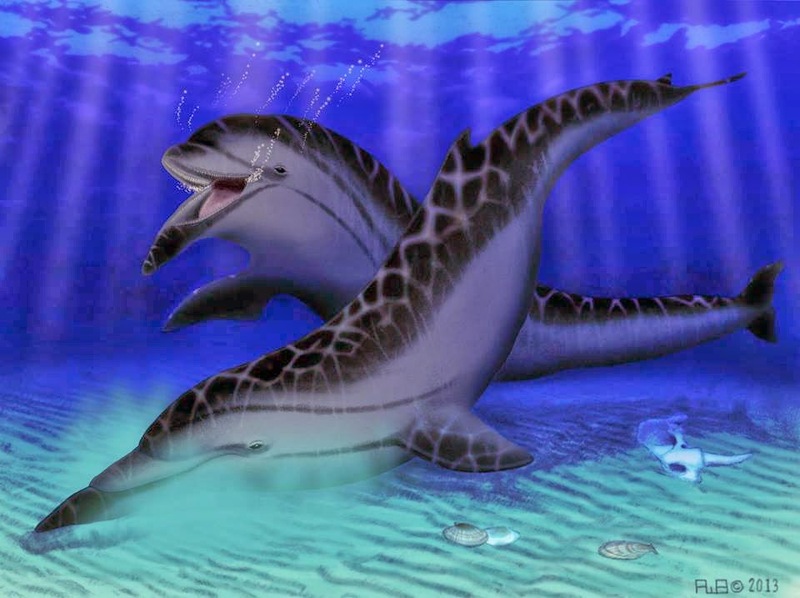 Marine vertebrate fossils including sharks, rays, bony fish, estuarine crocodiles, sea turtles, dolphins, and whales are abundant within the Belgrade Formation. This is one of the only Oligocene cetacean-bearing fossil localities on the east coast outside the Charleston area; deposits of the same unit at Onslow Beach, NC, yielded the holotype skull of the xenorophid dolphin Albertocetus meffordorum. Friday morning started early, meeting at the Hardee’s of Maysville, NC at 7:30 am for a quick breakfast and discussion of what to expect in the quarry. We were required to have steel toed boots, safety vests, and hard hats as Belgrade Quarry is an active mining operation. We headed out to the quarry at 8:00 am and watched a short video on quarry safety and what to do in case of emergencies. 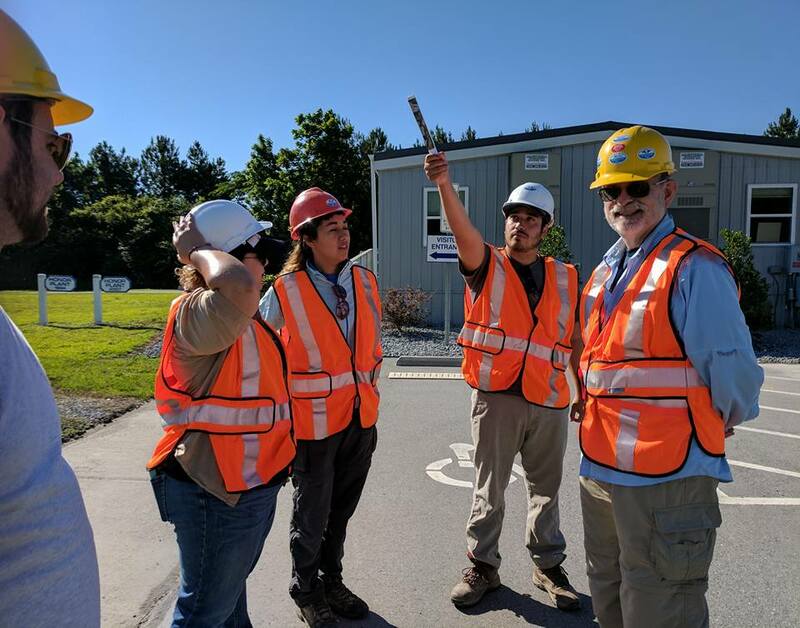 As they were blasting overburden that morning, we stuck around the office until 9:00 am as per safety protocol, and then it was off for a day of fossil hunting! We didn’t find quite so much as we had two weeks prior – and we think our earlier trip scoured the place fairly clean. 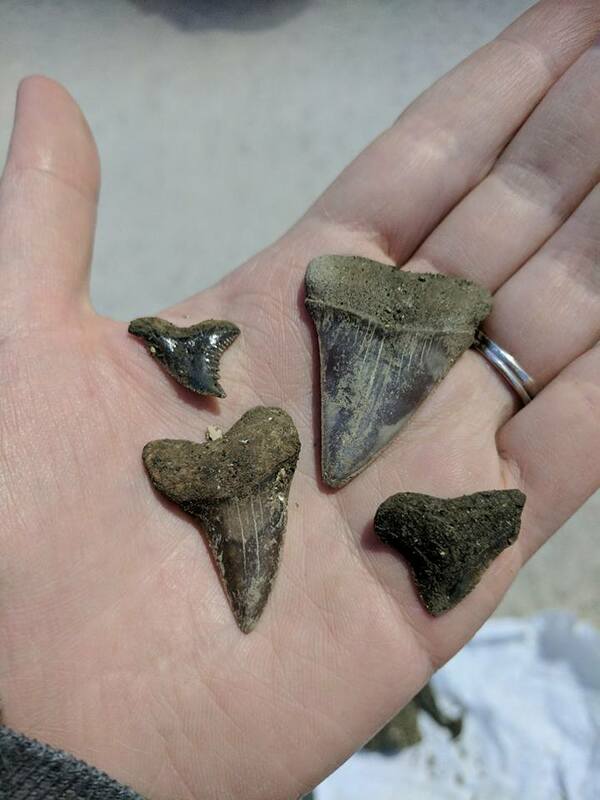 We did find a small number of sand tiger shark teeth (Carcharias cuspidata), tiger shark teeth (Galeocerdo casei, Physogaleus contortus), a nurse shark (Ginglymostoma), and many ray teeth (cf. Myliobatis). 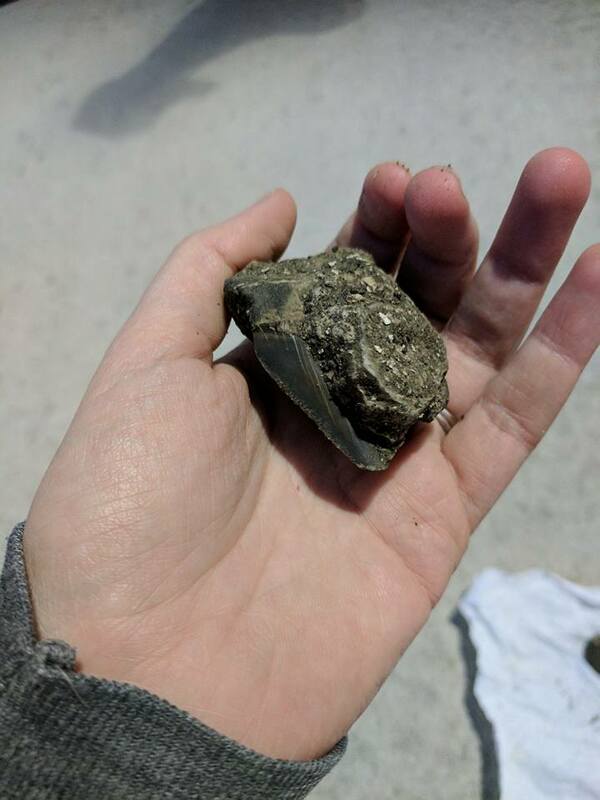 Bobby may have found a sperm whale tooth – which is surprising given the rather old Oligocene age of the strata, as only one Oligocene sperm whale is known (Ferecetotherium, Oligocene of Kazakhstan). After a busy and filthy day collecting in the quarry, we drove about an hour back to Aurora for showers and wonderful BBQ food. It was a time to relax and catch up with friends and colleagues, as well as setting up our outreach table for Saturday. 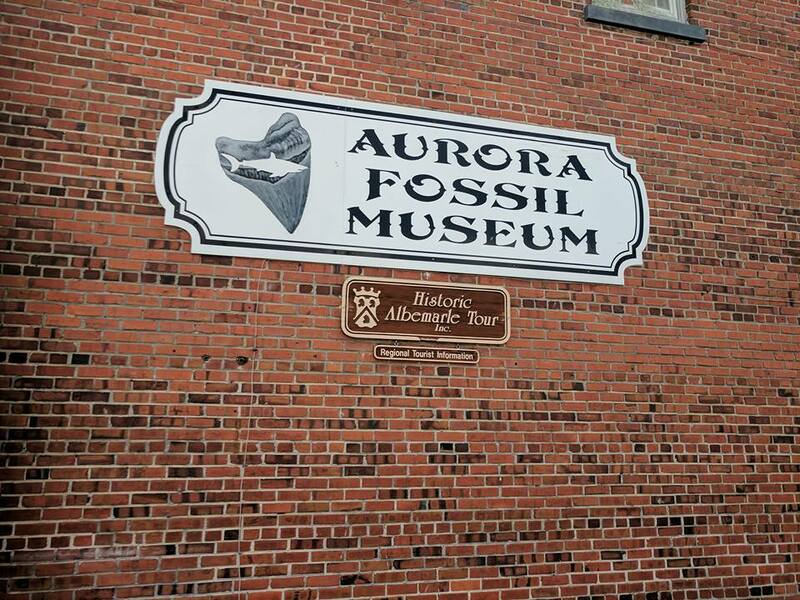 The Aurora Fossil Museum houses fossils from the famous Lee Creek Mine and though the mine has been closed to the public since 2009, truckloads of material from the mine are regularly bought in and dumped into large ‘spoil piles’ outside of the museum for collectors to pick through. 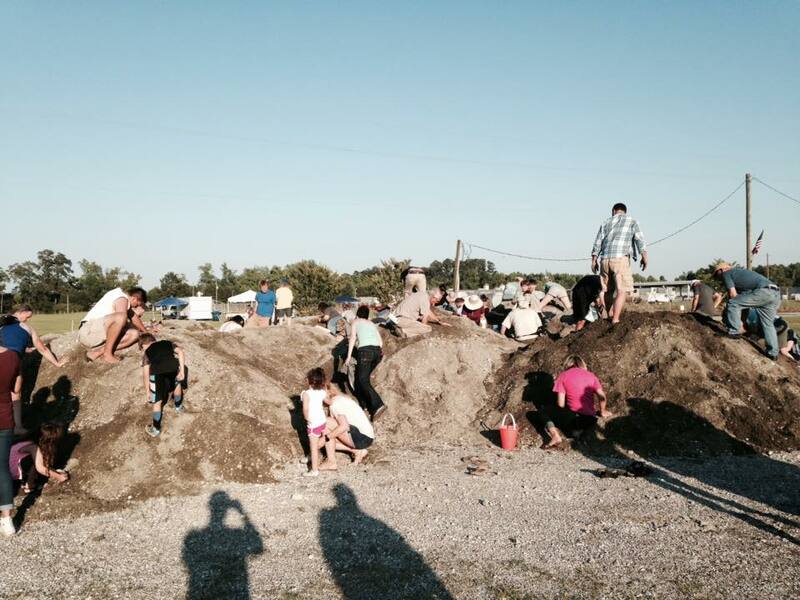 One truckload was brought in specifically for the fossil fest, and was roped off – until Friday at 6:00 pm. 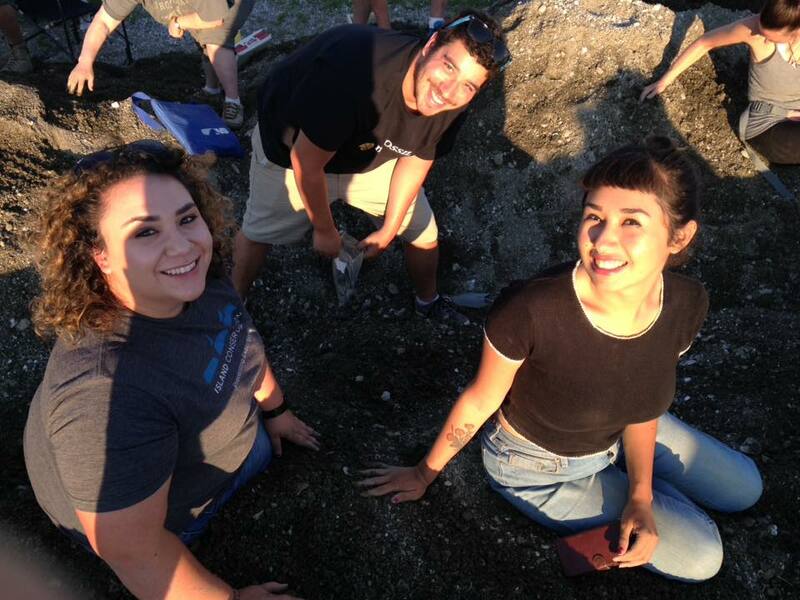 Visitors (and ourselves) simply could not resist the idea of fresh, untouched spoils from Lee Creek Mine – we spent some time in the pile before the keynote address, finding shark and cetacean teeth right off the bat. We picked up a bucket for the museum and will screen through the matrix this summer, and it will greatly supplement the McDaniel Collection here at CCNHM, which was made by Rita McDaniel, principally as surface collection – which tended to focus on larger specimens. This will give us a better snapshot of species represented by smaller teeth (rays, skates, basking sharks, horn sharks, megamouth sharks, etc.). Eventually though, we had to turn away from digging to attend the keynote address given by Bruce McFadden, curator of the Florida Museum of Natural History in Gainesville, Florida. 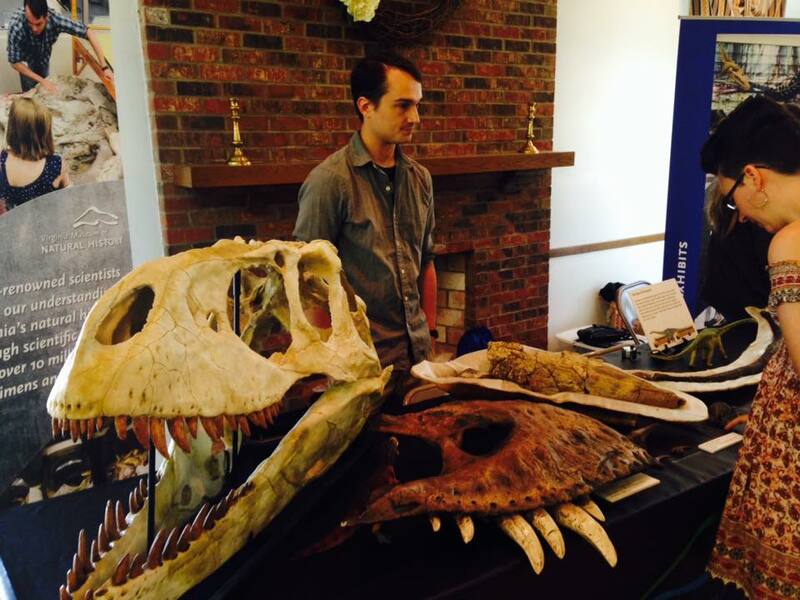 Bruce has spearheaded the Fossil Project, a group created to encourage the relationships between amateur and professional paleontologists. 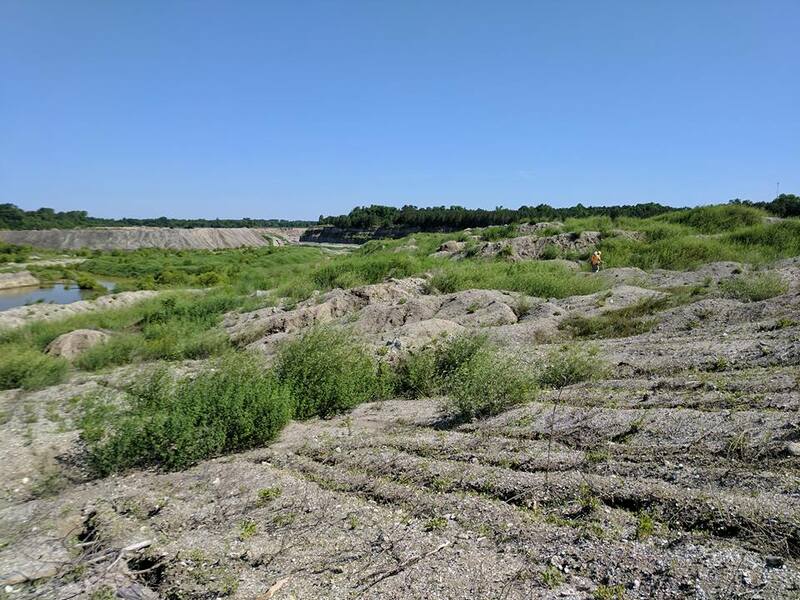 Bruce has an interest in the terrestrial mammals that can be found in the upper layers of the Belgrade Quarry, dating to about the Oligo-Miocene boundary. 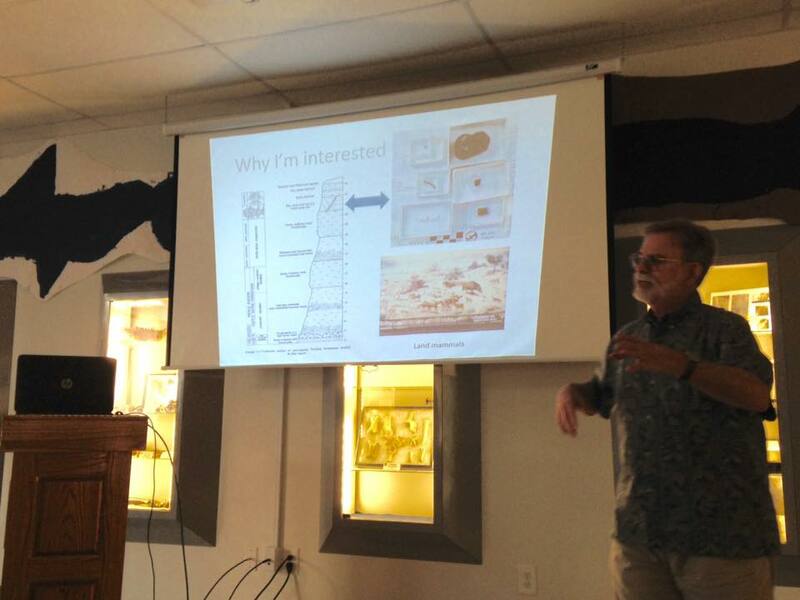 His talk expressed the importance these fossils have, and encouraged members of the fossil community to donate their finds so that the terrestrial mammal fauna could be studied and compared with better known assemblages from the Great Plains. 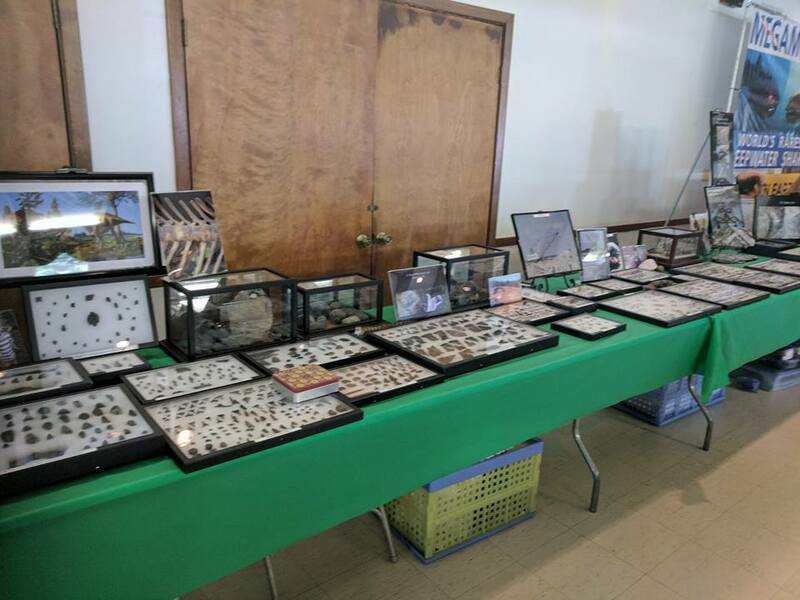 Saturday morning began the festivities for us; we set up our table the night before and were in the Community Center at 9:00 am to man (and woman) our outreach table. We were lucky to be in a building with air conditioning! Though it wasn’t nearly as warm as the previous year, we appreciated the cool air. Our day was busy – it went by incredibly fast! 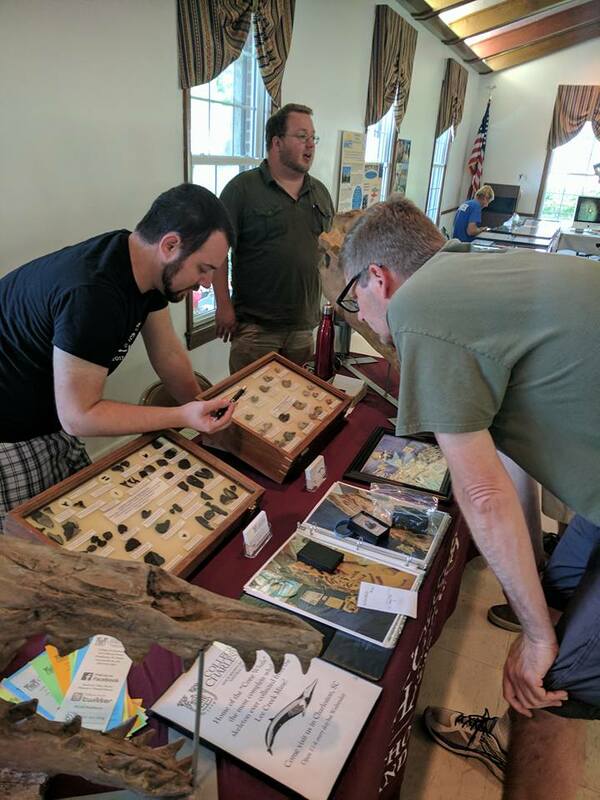 We got to interact with the public, IDing fossils for them and talking about CCNHM, as well as catching up with many of the members of the NCFC, and getting to see their impressive collections. 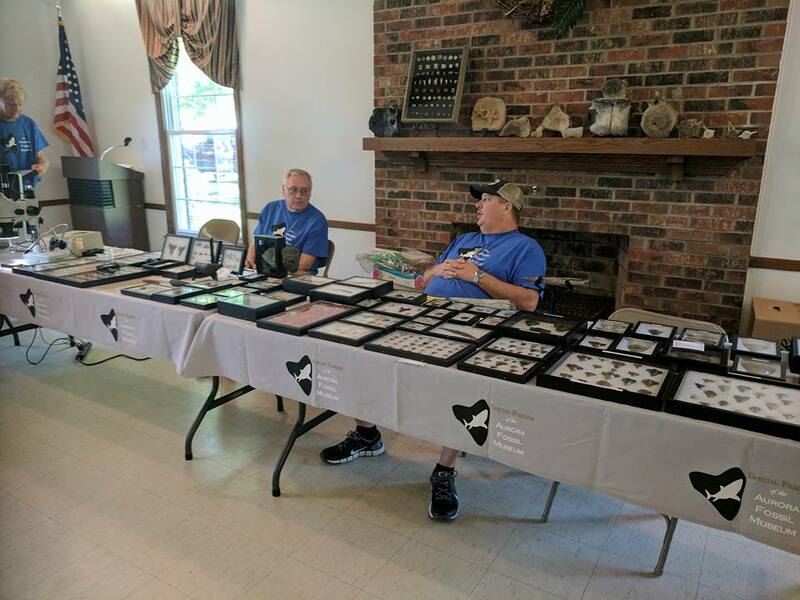 We were even lucky enough to snag several donations for our museum collections, which will in turn allow us to write a publication on the marine mammal fauna of Belgrade Quarry. 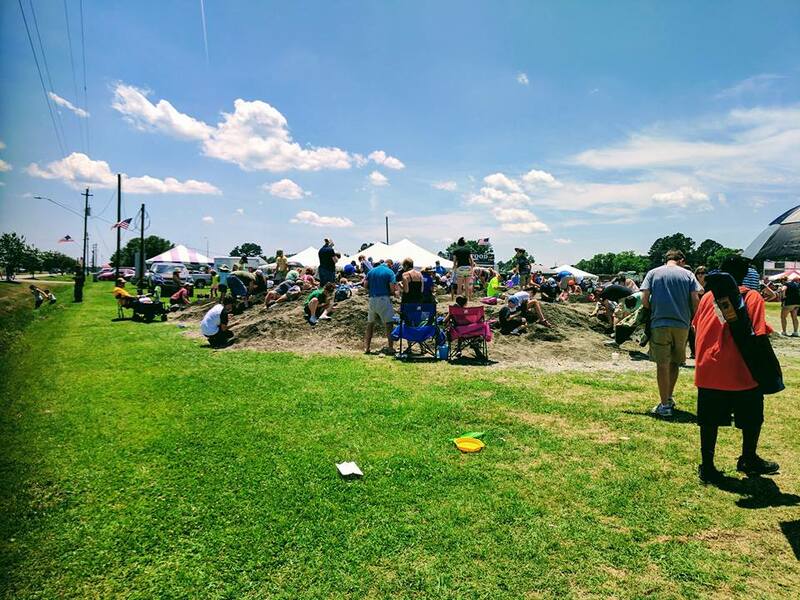 Plenty was going on outside of the Community Center as well; there were vendors selling an assortment of items, and all the fried food the south could offer, not to mention the continuously busy spoils pile and live music. 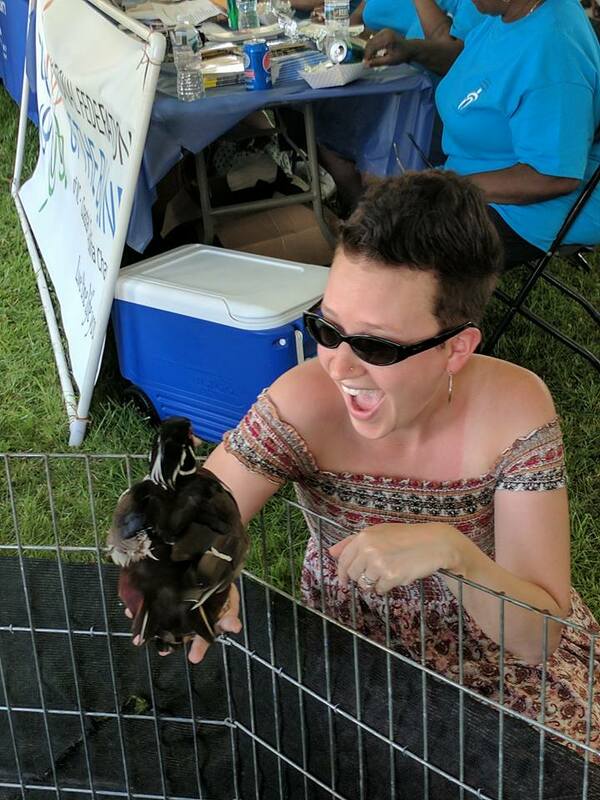 We took a break from our table to get some food and went through the education tent, and our collections manager Sarah was even able to (excitedly) hold a wood duck! We ended the day with a walkthrough of the Aurora Fossil Museum, and catching up with Cindy Crane, the director of the museum, and all around wonder-woman who brings this giant festival together each year. 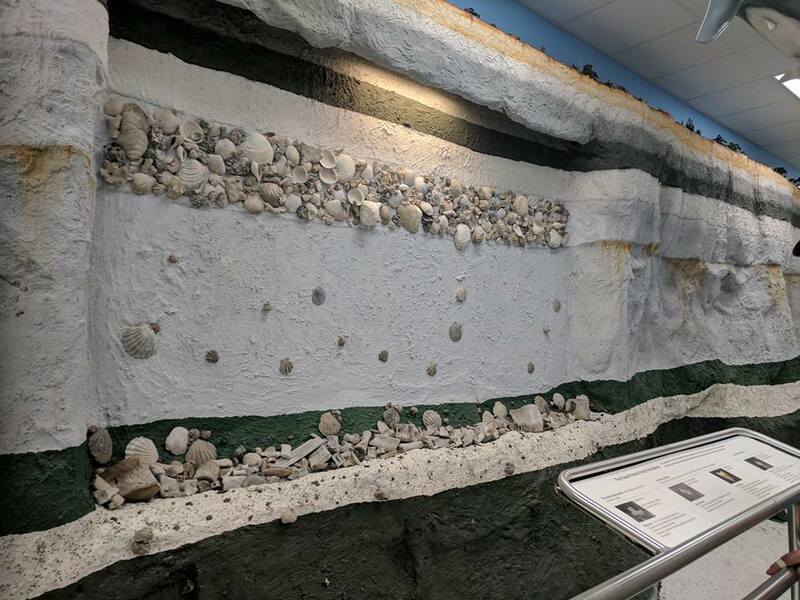 The museum houses an impressive number of shark displays, including modern and fossil (composite and associated) dentitions, numerous marine mammal fossils, and an entire room with a scale model of the Lee Creek Mine, where the layers are accurately depicted in color and thicknesses. 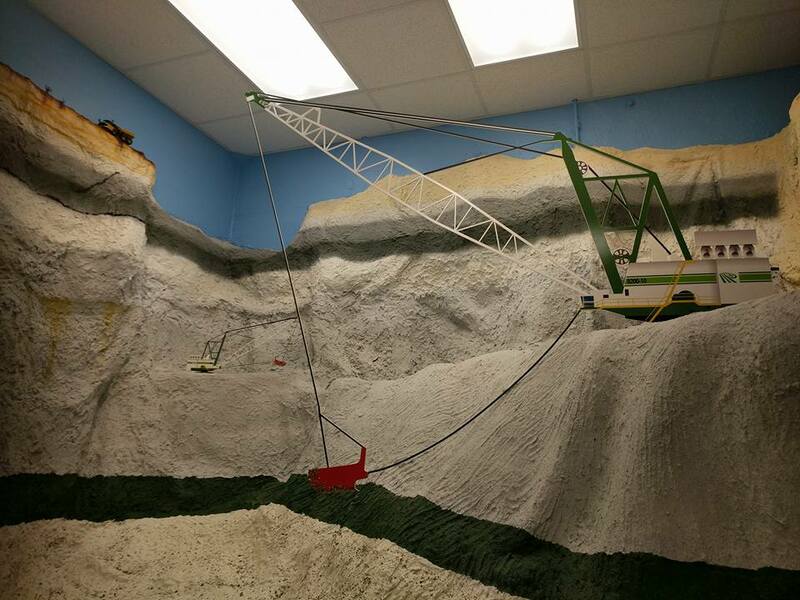 In this room, you can learn a bit about how the mine operates, what layers the fossils are found in, and why fossil remains are so abundant from the Lee Creek Mine. 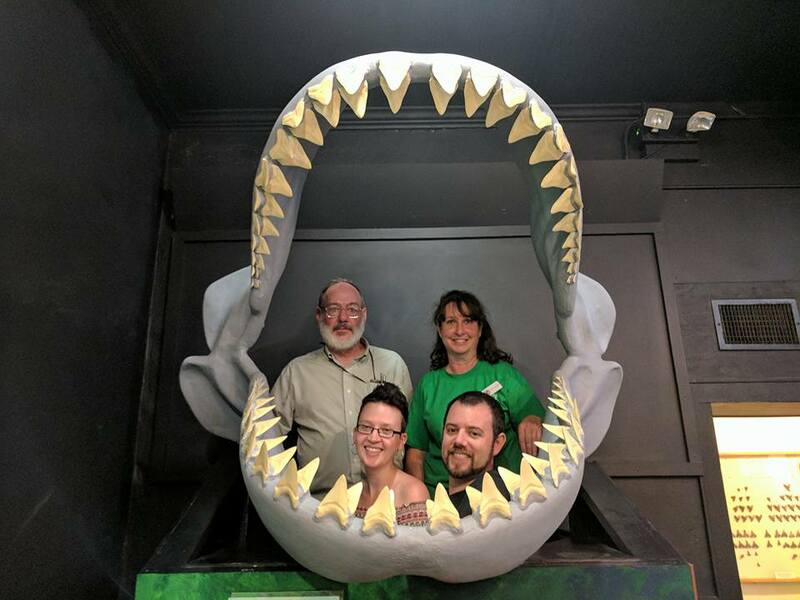 No visit is complete without a picture in the shark jaws! Dave Bohaska, Cindi Crane, Sarah Boessenecker, and Bobby Boessenecker after an exhausting day! 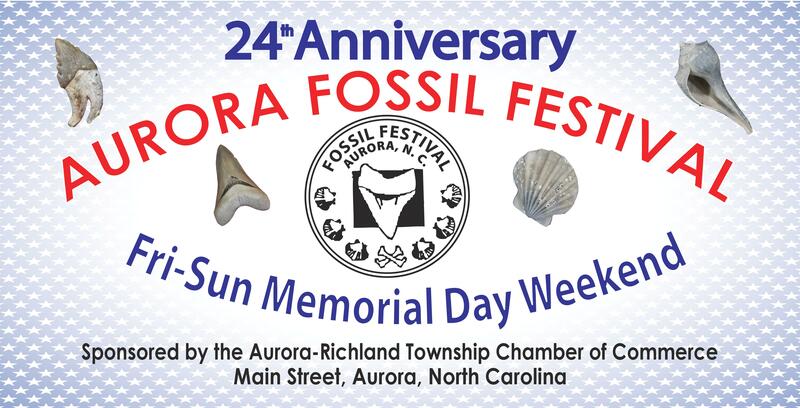 We ended the night with a spectacular fireworks display, with the excitement of returning next year for the 25th annual Fossil Festival, and the 40th birthday of the Aurora Fossil Museum! 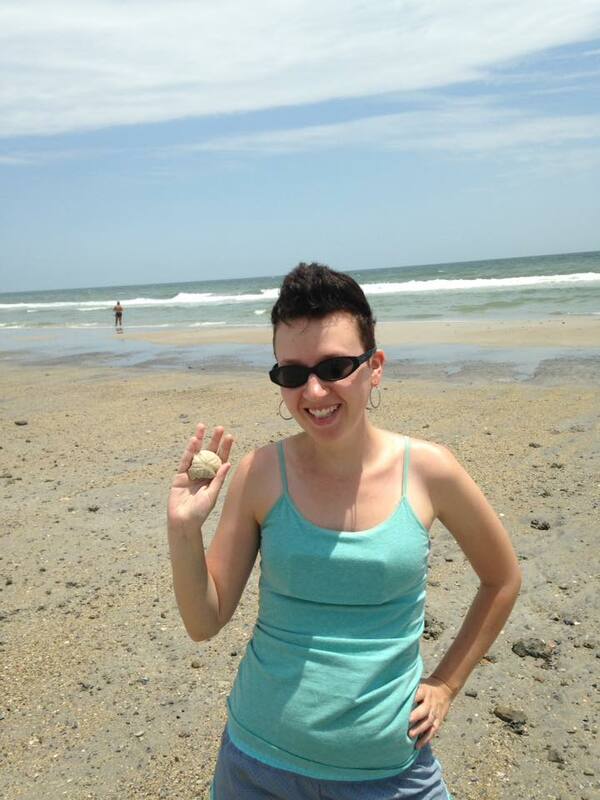 To break up the ~5.5 hour drive back to Charleston, we stopped at another fossil locality, Topsail Beach. 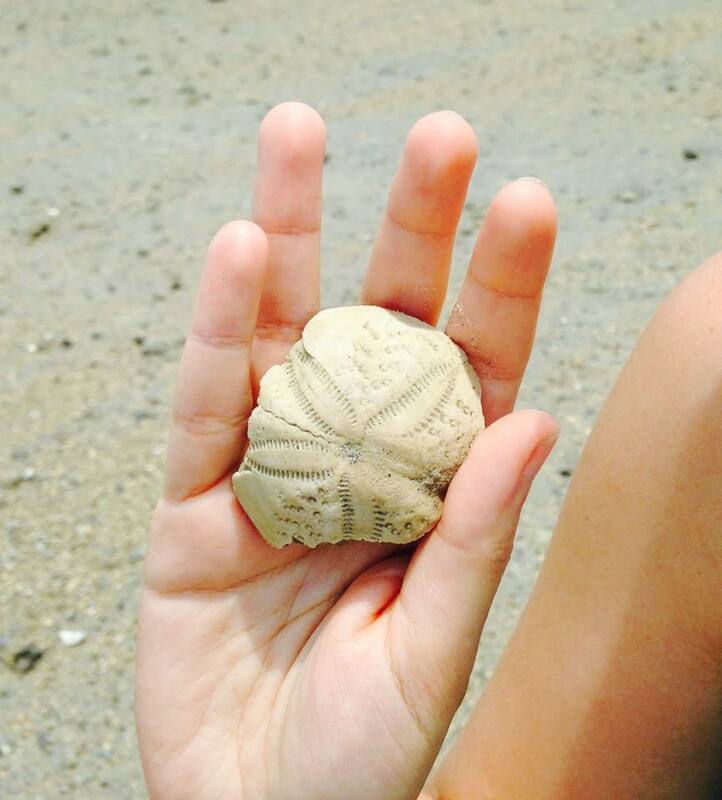 At topsail beach you can find Oligocene and Eocene Fossils such as shark teeth, whale, dolphin, and sea cow bones and teeth, as well as echinoids (sea urchins and sea biscuits). 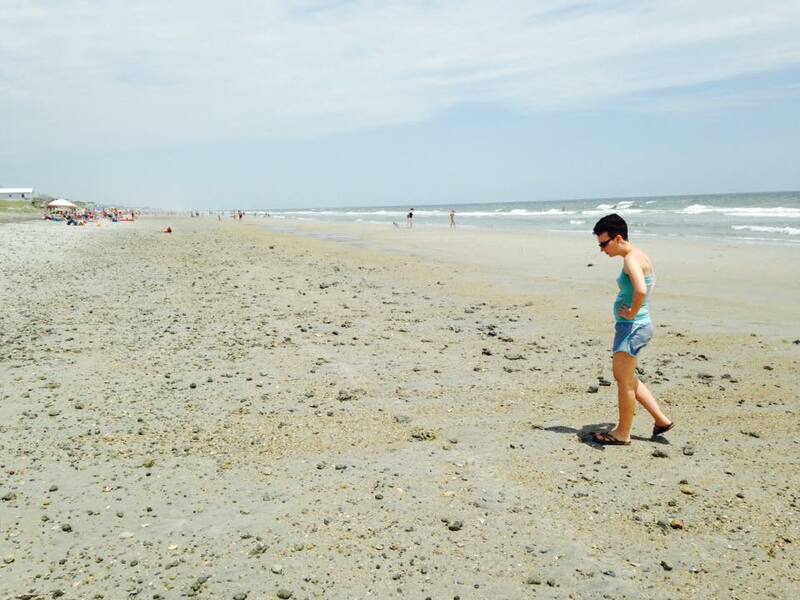 Collecting at Topsail Beach is similar to collecting here at Folly Beach near Charleston, but with a higher chance of finding precious Oligocene marine mammal fossils. Marine mammals found at Folly tend to be younger (Miocene and Pliocene). 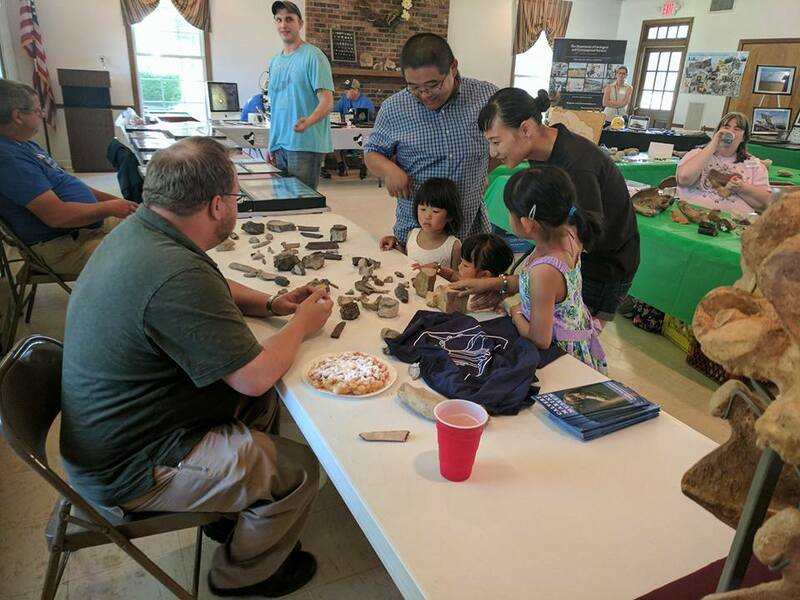 All in all, it was a hugely successful and fun weekend, and we would like to thank Cindi and the Special Friends of the Aurora Fossil Museum for extending an invite to us, as well as the North Carolina Fossil Club for their continuous generosity in both donations and inclusion in their events. We will see you all next year, if not sooner! Folly Beach is a popular destination near us here in Charleston, and thousands of swimmers, sun tanners, and surfers flock to the beach during the summer and relatively warm spring and fall months; the water is a few degrees warmer than Hawaii, and we will on occasion leave work early every couple of weeks to go swimming. Folly started out as a bit of an artist’s village, and is where George Gershwin wrote the opera “Porgy and Bess” about life in Charleston. 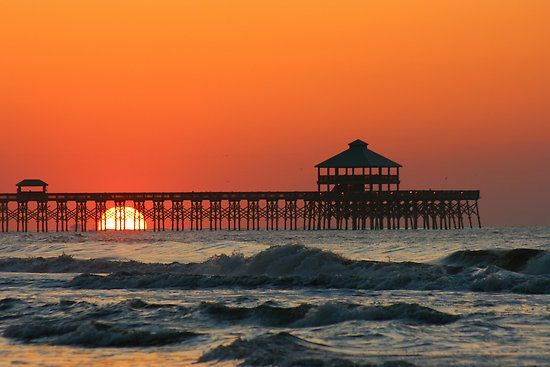 Folly Beach is a barrier island, separated from Charleston Harbor to the northeast only by the relatively small Morris Island – the location of Battery Wagner. Battery Wagner was a Confederate artillery battery guarding Charleston Harbor, assaulted in 1863 by Union troops including the 54th Massachusetts Volunteer Infantry – one of the first African American units in the Union Army – and depicted in the 1989 film “Glory”. Hurricanes occasionally uncover Civil War era artifacts, and after Hurricane Matthew last fall, beach walkers found an uncovered store of cannon balls – unclear if solid “round shot” or mortar shells filled with black powder – which, regardless, were detonated by a bomb squad. Tropical Storm Hermine and Hurricane Matthew uncovered quite a bit of older material this last fall, chiefly fossils and limestone blocks dating to the last 30 million years. 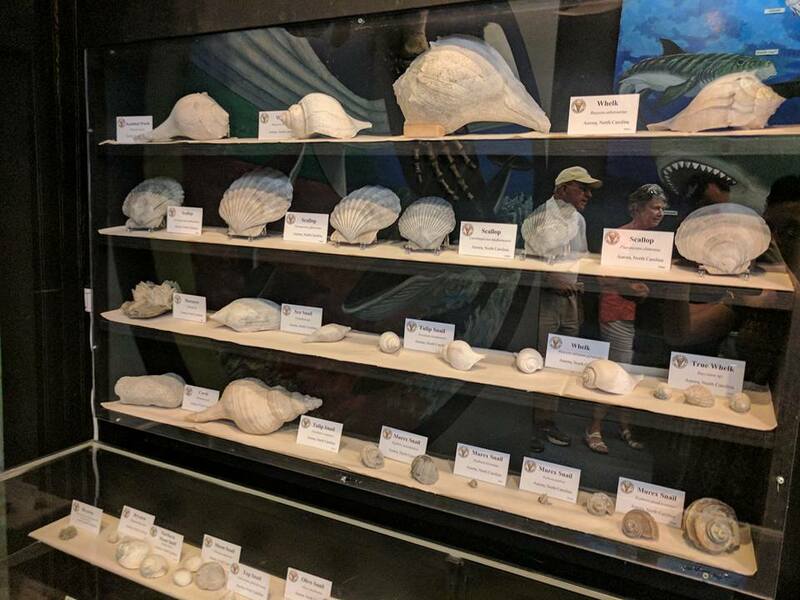 A variety of fossils can be found on the beach at Folly, and while not as plentiful as at Edisto Beach, Folly is much closer to us. 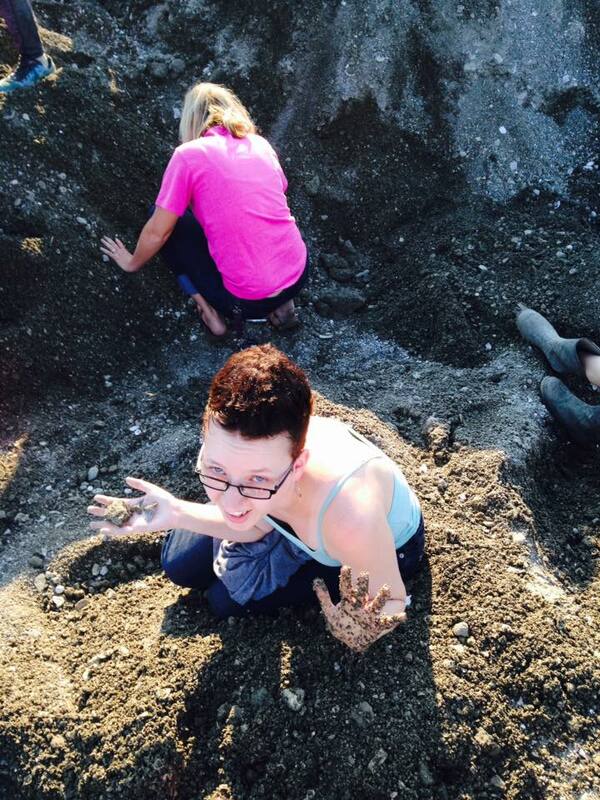 We’ve gone several times recently, and collected many pounds of fossils. One major scientific issue with collecting fossils from Folly is that the source of the specimens is inconclusively known – and any consideration of the stratigraphic (i.e. geologic) source of the fossils is speculative. 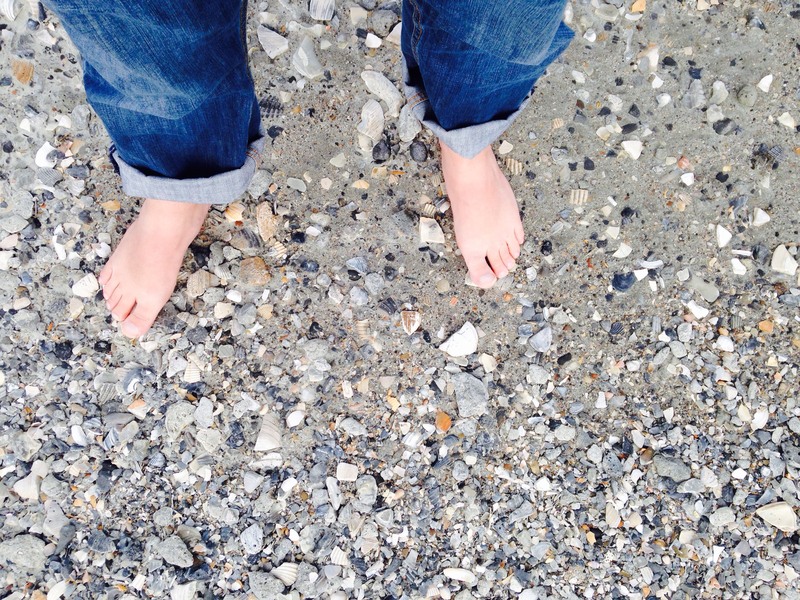 Fossils occur isolated on the beach, and except in rare cases, vertebrate fossils do not have any adhering rock. No fossiliferous exposures crop out at Folly, and fossils come from two different sources: 1) natural submarine exposures just offshore and within rivers, washed back onto the beach and 2) sediment delivered by beach renourishment. Folly Beach has been eroding away, and within living memory the width of beach and dunes has decreased noticeably, with hurricanes like Hugo (1989) contributing; other factors include the construction of the Charleston harbor jetties, which prevent sediment from Sullivan’s Island being transported south to Morris and Folly. Sediment for renourishment is either dredged or piped up from “borrow” areas – some of which are in river mouths, but most is from about 3 miles offshore. Renourishment in 2015 from the offshore borrow area introduced a large number of limestone nodules, which have been the source of much ire and complaining from Folly residents, but possibly a boon for geologists. We still don’t have a great idea of what strata are exposed in these areas, and several problems plague stratigraphy in the Charleston embayment: 1) Exposures are rare and many deposits are known only in the subsurface, either from well cores or seismic data; 2) many deposits, according to seismic data, are not laterally extensive and taper out over a few miles – making mapping and correlation a bit of a nightmare. We’ll be using the stratigraphic framework from the geologic map of the area published recently by USGS stratigrapher and paleontologist Rob Weems and others (2014). But before we get there, what fossils can you find? 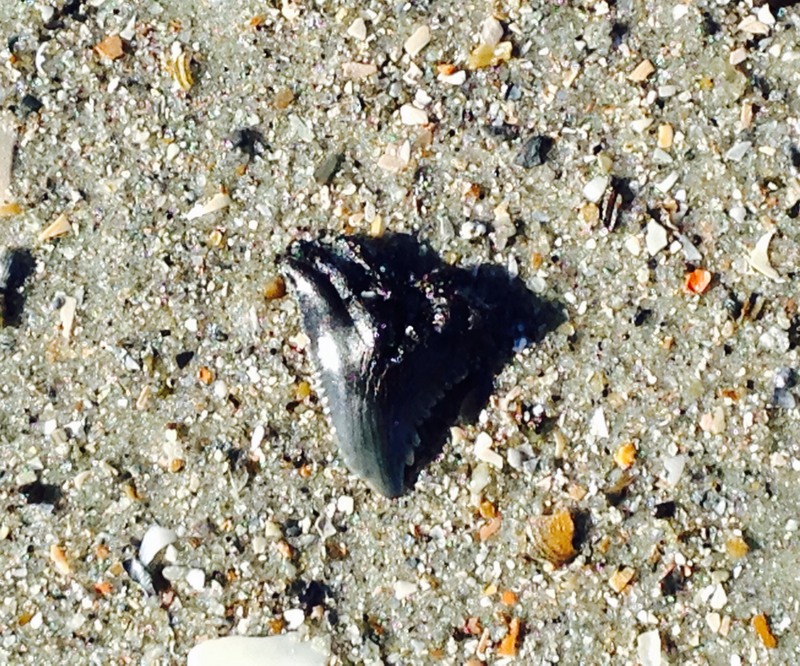 Most visitors come for the shark teeth – and shark teeth can be found. They are perhaps not as common at Folly as at other beaches in the southeastern USA, but I’ve walked away with a dozen after only a couple hours of searching. 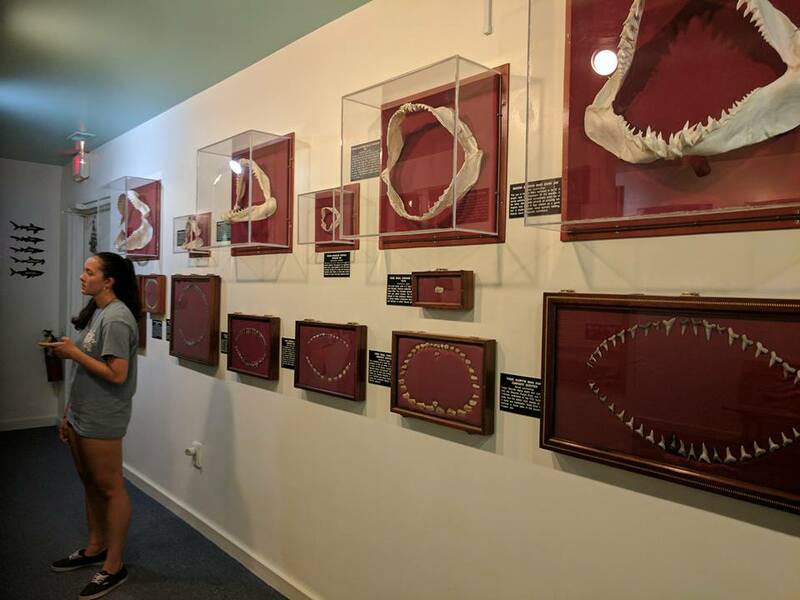 Common shark teeth include Sand tigers (Odontaspis, Carcharias; Oligocene-Recent), and reef and lemon sharks (Carcharhinus, Negaprion; Eocene-Recent). 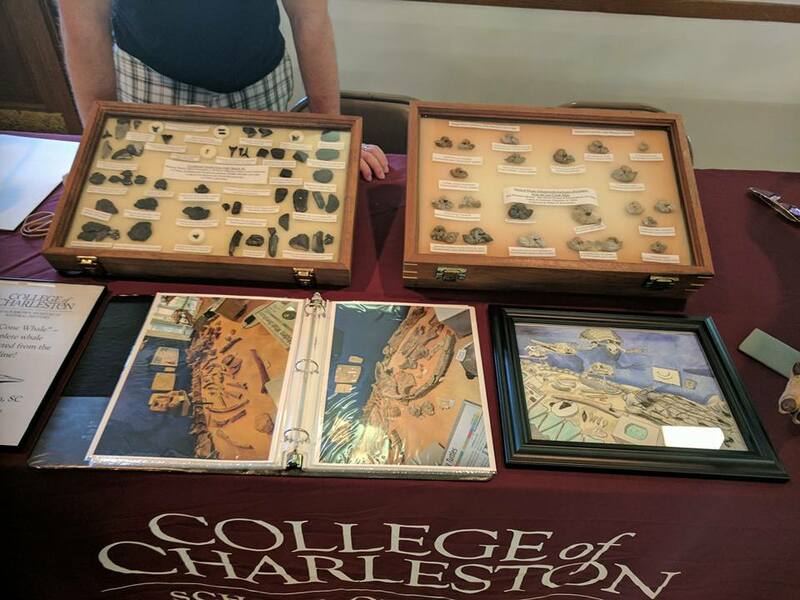 These all have long stratigraphic ranges, and are notoriously difficult to identify – and could come from any of the Oligocene through Pleistocene strata in the Charleston area. 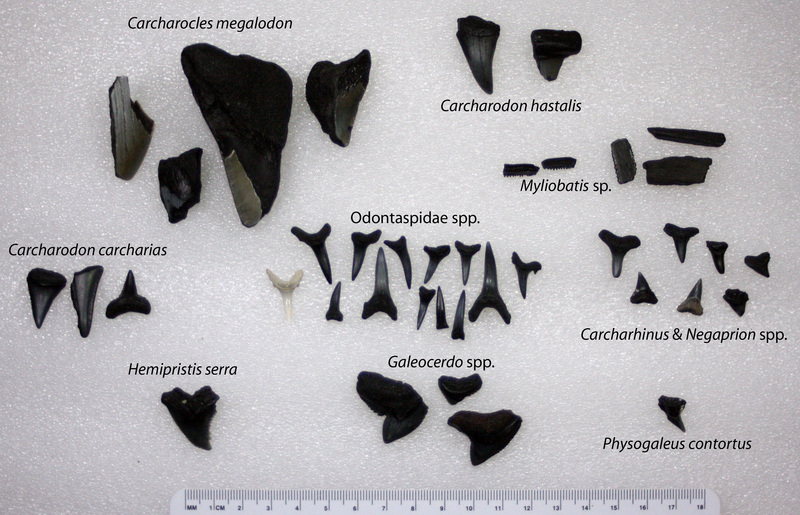 Some of the rarer, larger, and more highly sought after teeth including great white sharks (Carcharodon carcharias, Pliocene-Recent), “bigtooth makos” (Carcharodon hastalis, early-late Miocene), and the megatoothed sharks (Carcharocles megalodon, early middle Miocene to early Pliocene; Carcharocles angustidens, Oligocene), tiger sharks (Galeocerdo, Physogaleus spp. ), and snaggletooth sharks (Hemipristis serra, Eocene-Pleistocene) are somewhat better age indicators. Confusingly, all of these occur at Folly Beach – indicating that Oligocene, Miocene, and Pliocene rocks all occur nearby or in the borrow areas. Other sharks including bat rays also occur, and shark/ray vertebrae are also known. Fossils of bony fish are common, but typically left behind. Common examples include beaks of the pufferfish Chilomycterus schoepfi (early Miocene to Recent), partial skulls of sea robins (Prionotus sp., Pliocene-Recent), partial skulls of bonitos (Sarda sp. 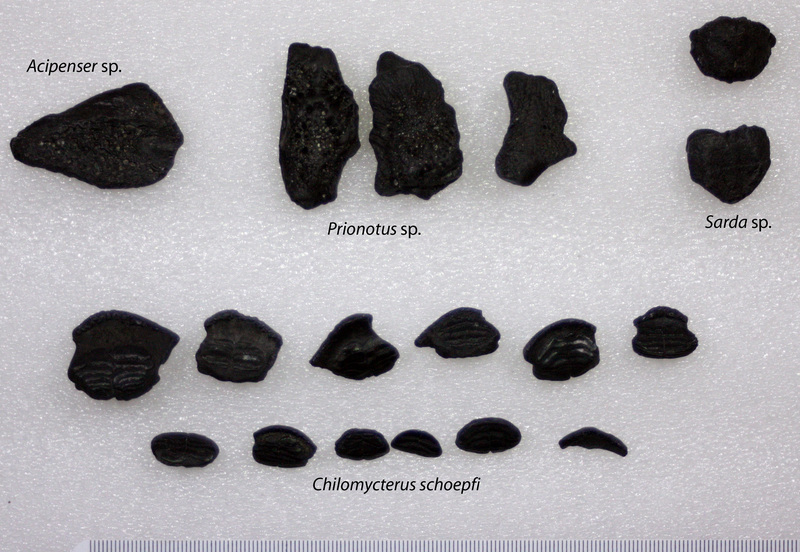 ; Eocene-Recent), and osteoderms of a sturgeon (Acipenser sp., Cretaceous to Recent). Fish bones are a bit of a nightmare for paleontologists, since fish have such a high number of bones that typically disarticulate, and comparable parts are rarely found. At Folly, mostly well-preserved, dense elements resistant to destruction are found, meaning that it is relatively easy to find consistently occurring specimens of the same morphology. Unfortunately, we have no record of the more delicately built fishes. Reptile fossils are in abundance, unlike equivalent deposits on the west coast. 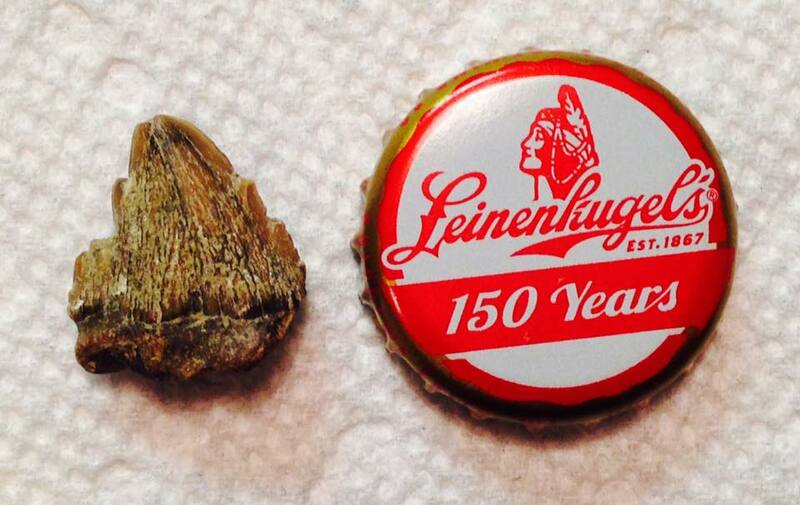 Turtle shell elements are actually quite common, and readily identifiable – for someone who knows about turtles. Shell identification of turtles has always seemed like a black art, but we’ve got quite a few now. Specimens obvious enough for chelonian novices like us include large tortoises (Geochelone, Eocene-Recent, or Hesperotestudo, Miocene-Recent), some sort of a large softshell turtle (Trionychidae indet., Cretaceous-Recent), and pond turtles (Emydidae, Cretaceous-Recent). Our collection includes a large, somewhat flat leg spur of a large tortoise. 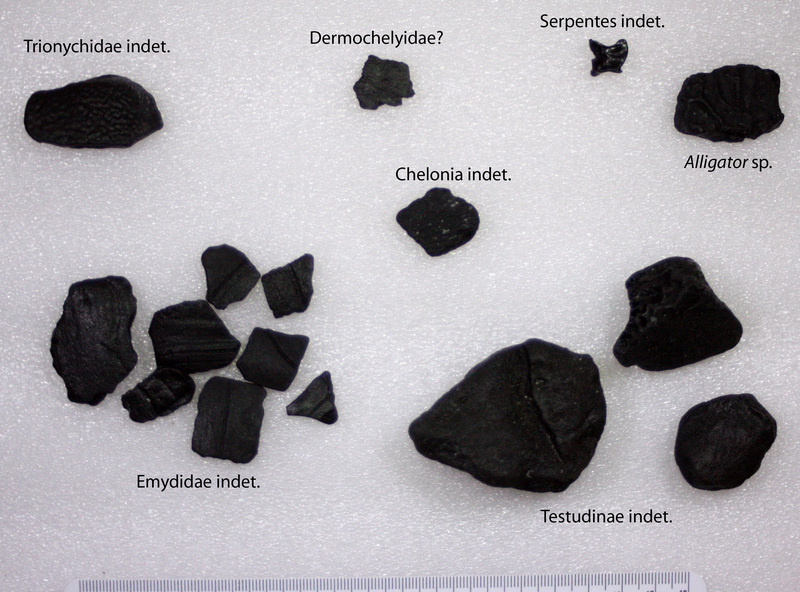 Sea turtles should be encountered, but it’s unclear if our preliminary searches have uncovered any; a single possible osteoderm of a leatherback sea turtle (Dermochelyidae indet., Eocene-Recent) was collected just a few days ago. Crocodilian remains are comparably rare, and we recently collected a partial osteoderm (scute) of extant Alligator (Eocene-Recent). Mammalian bones are the most commonly encountered fossils, and these are almost always left behind. 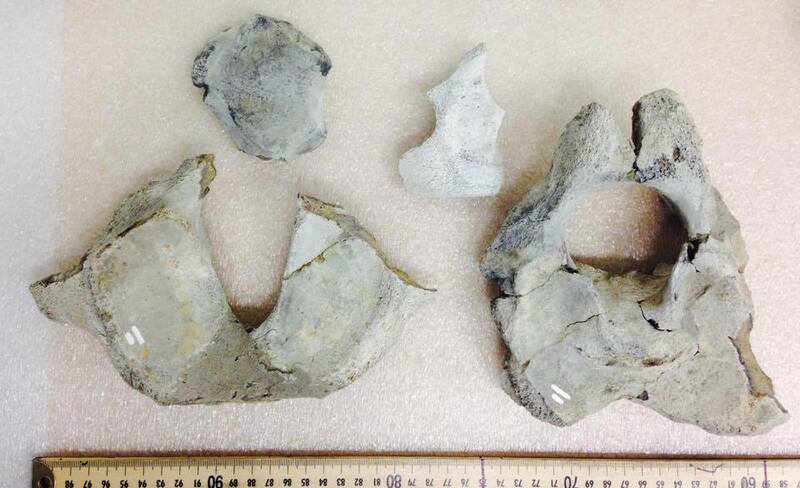 These are fragments of much larger bones – by volume, most I assume are from whales (ribs, mandibles). 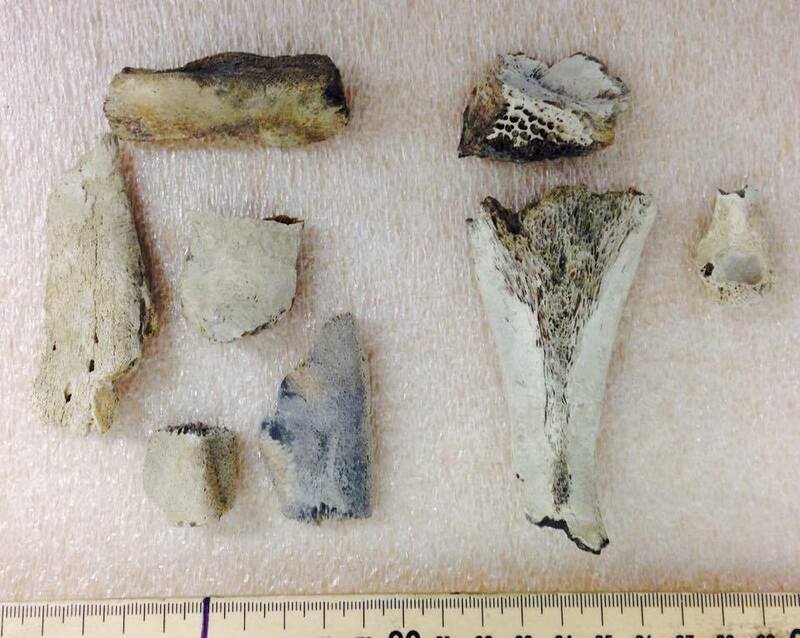 On occasion highly dense bone fragments likely represent pieces of sea cow (Sirenian) ribs. It is worth picking up each one and checking it over to make sure it’s not an identifiable specimen before chucking it back into the sand. Land mammal remains are quite common, and include shards of thin-walled bones with a large marrow cavity (clearly not marine mammals), teeth, and tooth fragments. 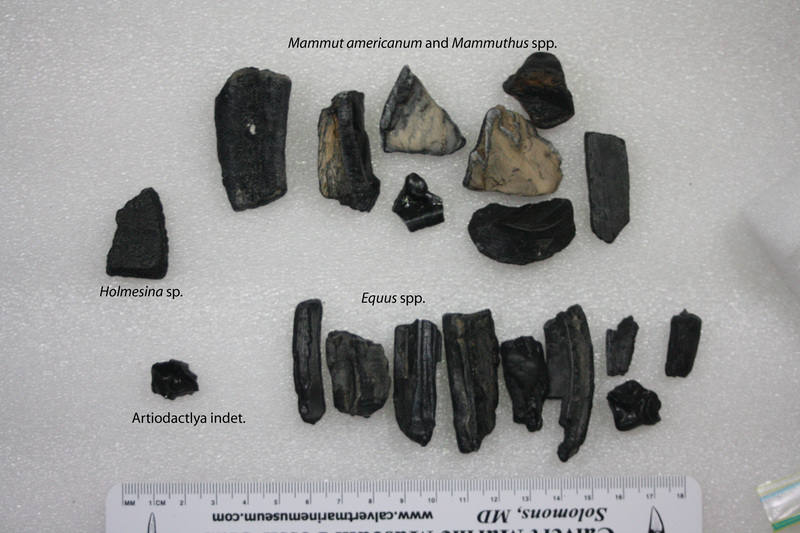 Horse teeth and fragments thereof are perhaps the most common (Equus sp., Pliocene-Recent), and fragments of teeth and tusks of American mastodon (Mammut americanum, Pliocene-Recent) and woolly mammoths (Mammuthus spp., Pleistoecne-Recent). Tusk fragments of the latter can be identified based on distinctive cross-hatching in cross-section. Teeth of artiodactyls are less common (e.g. Bison, Pleistocene-Recent). 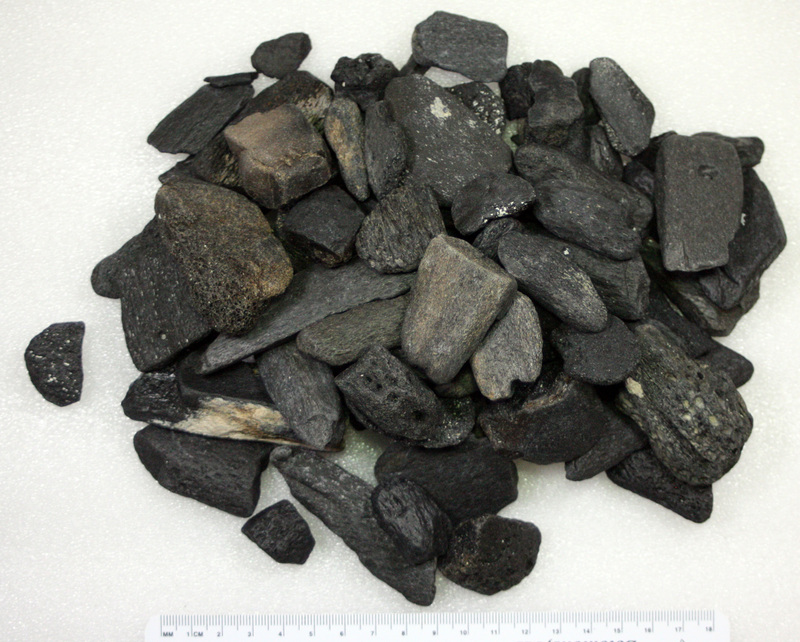 Our growing collection also includes remains of edentates – including osteoderms of the giant armadillo Holmesina. Occasionally identifiable specimens of whales and dolphins (Cetacea) are found. Marine mammals are more difficult to identify than terrestrial mammals, as teeth are either completely absent (baleen whales) or the teeth are similar between species (toothed whales). Earbones are quite important instead, and two different types of earbones may be found – the periotic and the tympanic bulla. Each look quite strange, but if complete enough, are identifiable to the family, genus, and occasionally species level. 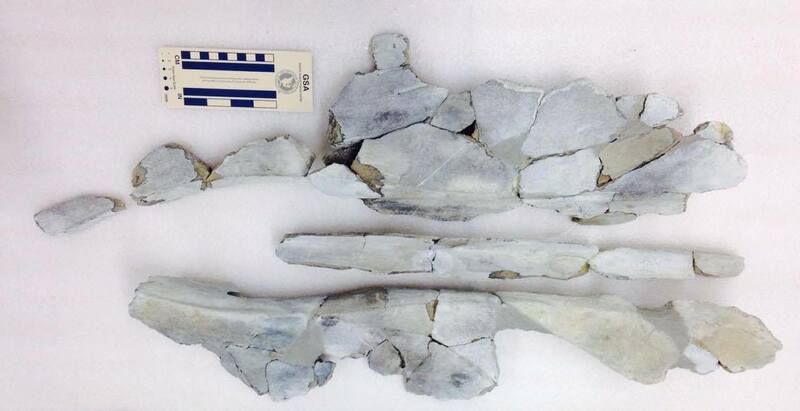 One recent find by us includes a partial periotic of baleen whale similar to Parietobalaena from the early-middle Miocene Calvert Formation of Maryland. Another specimen, recently donated by Edisto State Beach Ranger Ashby Gale, is a periotic of a pygmy sperm whale (Kogiidae indet. 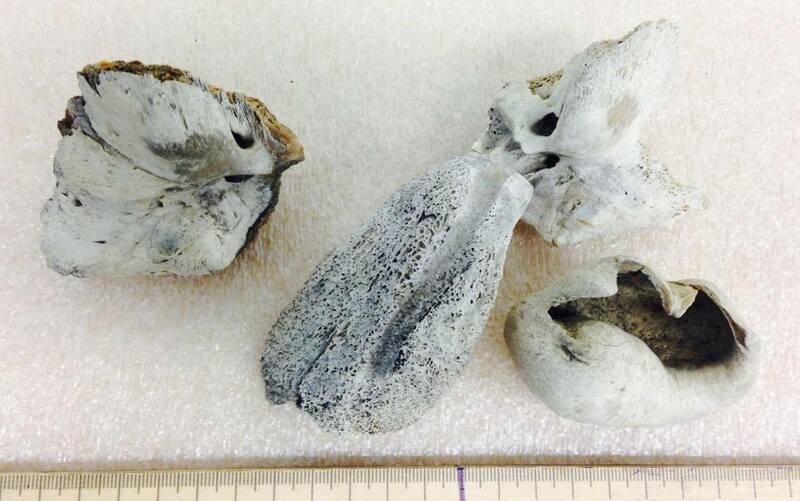 ), an unnamed species that is so far known only from periotics from the Pliocene of North Carolina and Florida. The specimen is not photographed here because it is currently being molded and casted. For every genuine vertebrate tooth or bone on the beach, there are about a thousand shells and a handful of black phosphate pebbles. Phosphate is a type of sedimentary “nodule” or concretion formed during periods of low sea level with slowed deposition. 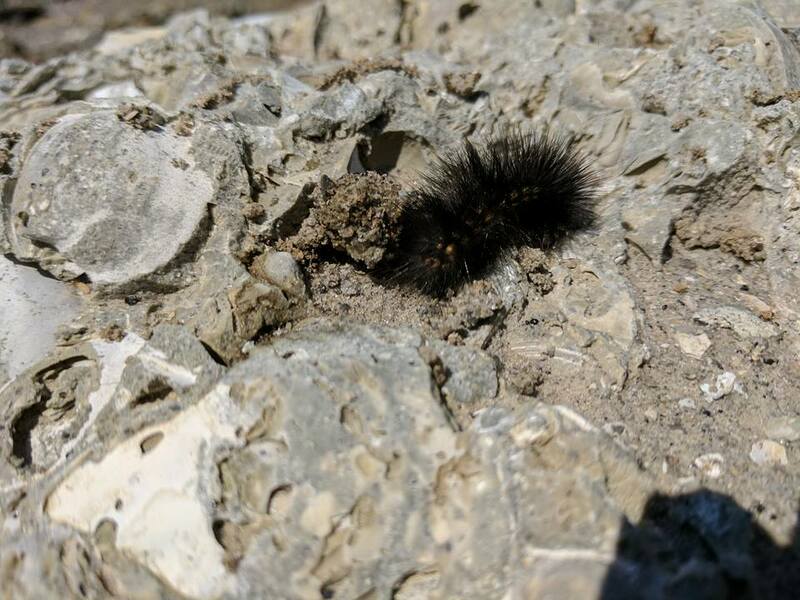 Slow deposition also favors the formation of vertebrate rich bonebeds – when phosphate pebbles are present in an area, they are usually concentrated and formed under the same conditions that characterize the concentration of vertebrate fossils into bonebeds. 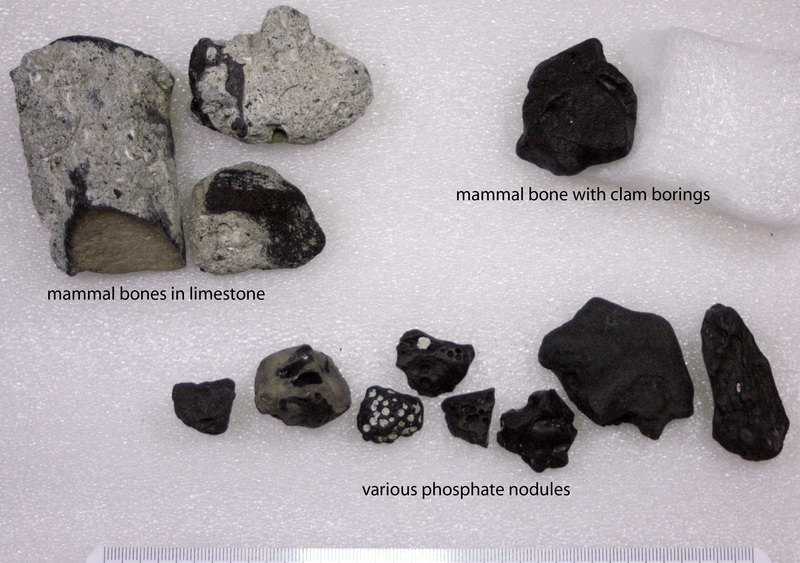 Simply put, if black phosphate pebbles are common, look for bones and teeth! Also keep your eyes peeled for coprolites – fossilized poop. Phosphate pebbles which look like poop are very likely to be just that. Coprolites, bones, and teeth are all phosphatic, and share the same chemistry with phosphate pebbles. 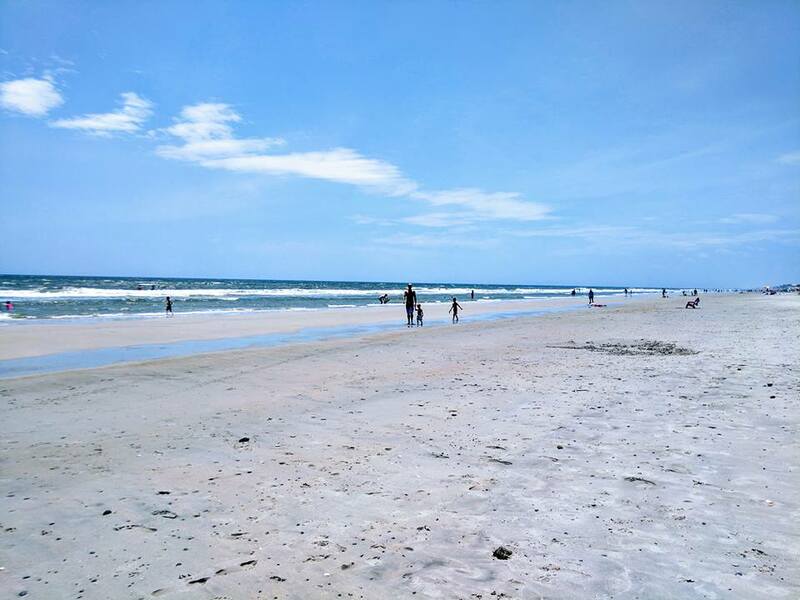 So, we know that there are fossils from the Oligocene, sometime in the early-middle Miocene, the Pliocene, and the Pleistocene from Folly Beach – all mixed together, naturally and by beach renourishment. The geologic map of Charleston published by Rob Weems includes deposits of the lower Oligocene Ashley Formation, the lower Miocene Marks Head Formation, the Pliocene Goose Creek Formation, and the upper Pleistocene Wando Formation. We think that these strata are the likely sources of the fossils from Folly Beach, with the terrestrial reptiles and land mammals all originating from the Pleistocene Wando Formation. We need your help! 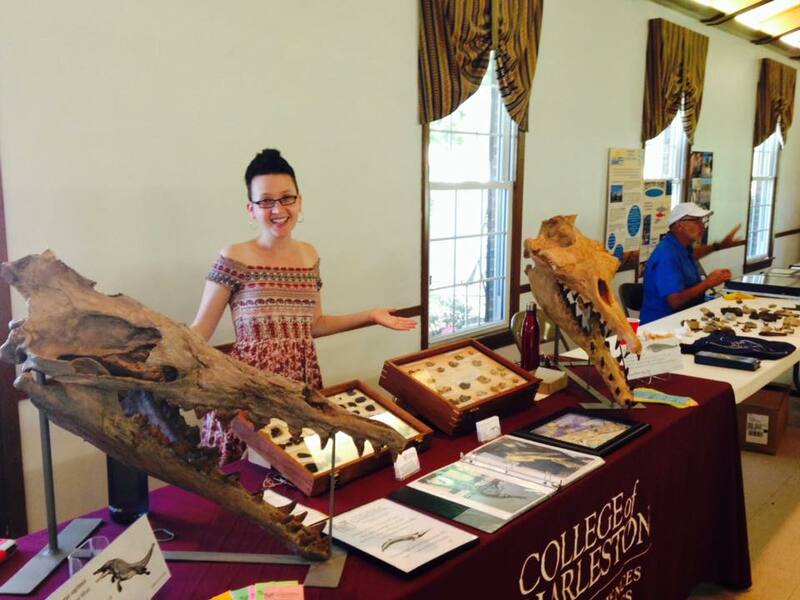 The vertebrate fossils of Folly Beach have never been published before in a scientific paper. 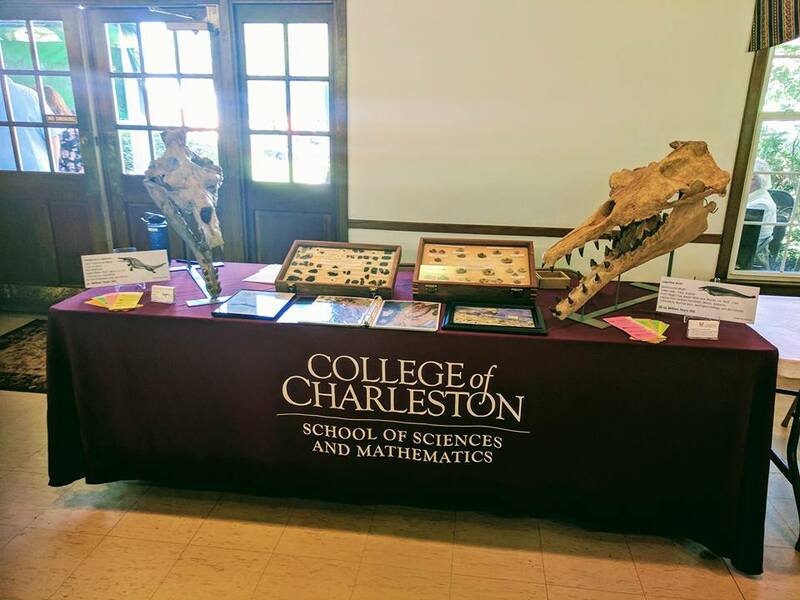 We are currently seeking donations of vertebrate fossils from Folly Beach to help “fill out” the fossil assemblage in our collection in order to permit scientific study of the locality. 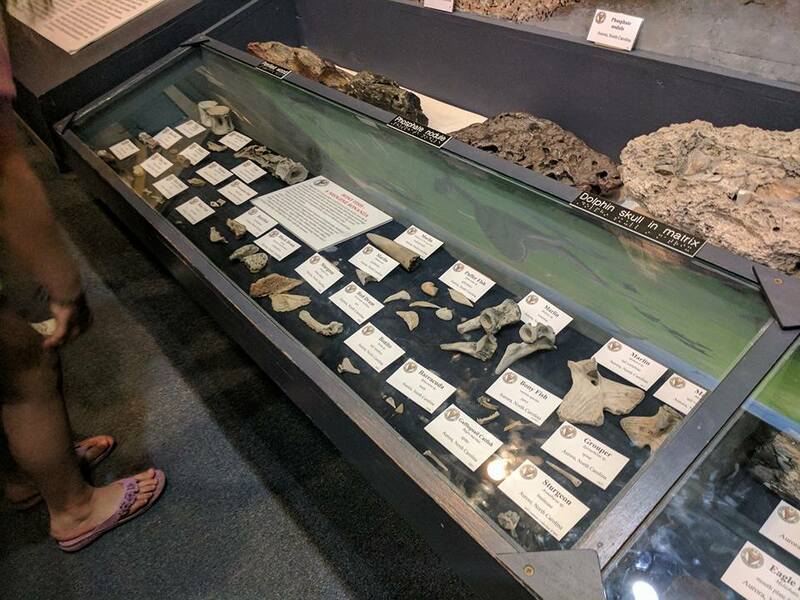 If you have found some of the more uncommon fossils – in particular, whale or dolphin earbones or mammal teeth – we encourage you to consider donating the specimens to CCNHM for scientific study and display in our museum! Weems, R.E., Lewis, W.C., and Lemon, E.M., Jr., 2014, Surficial geologic map of the Charleston region, Berkeley, Charleston, Colleton, Dorchester, and Georgetown Counties, South Carolina: U.S. Geological Survey Open-File Report 2013–1030, 1 sheet, scale 1:100,000, http://dx.doi.org/10.3133/ofr20131030. 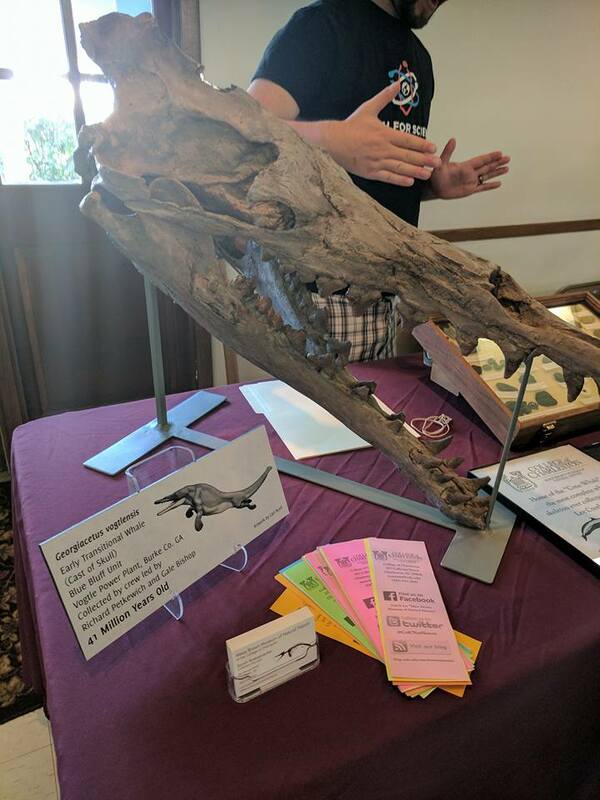 Two weeks ago, fossil collector Lee Cone (President of the Special Friends of the Aurora Fossil Museum) donated a spectacular skeleton of a large baleen whale (Mysticeti) from the Lee Creek Mine (read about it here). A skeleton of a mysticete like this is unprecedented as it includes a partial skull, earbones, mandibles, vertebrae, and ribs. However, it also includes a number of other fossils that decidedly do not belong to the whale – including non-cetaceans, parts of at least one or two additional mysticete whales, and at least two pygmy sperm whales (Kogiidae). 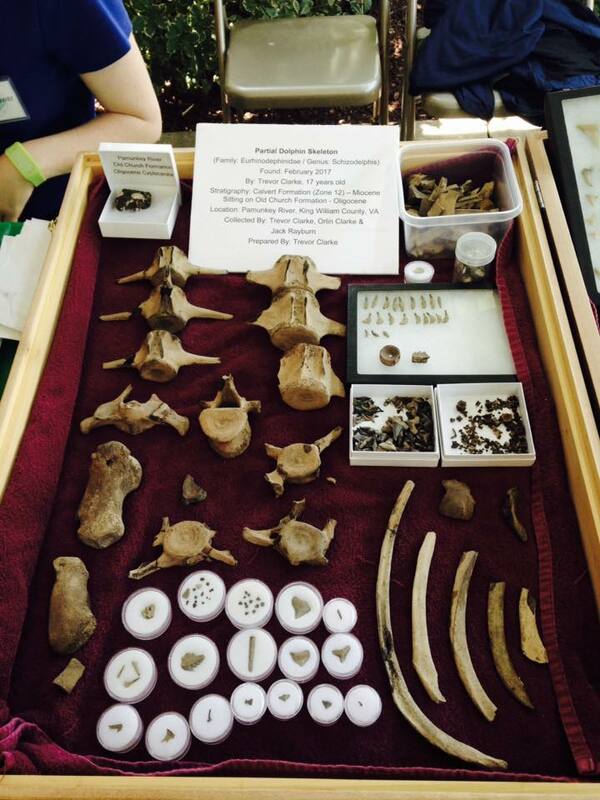 Several bones mixed in with the whale record the presence of sea turtles, a sea bird, a sturgeon, and a billfish. 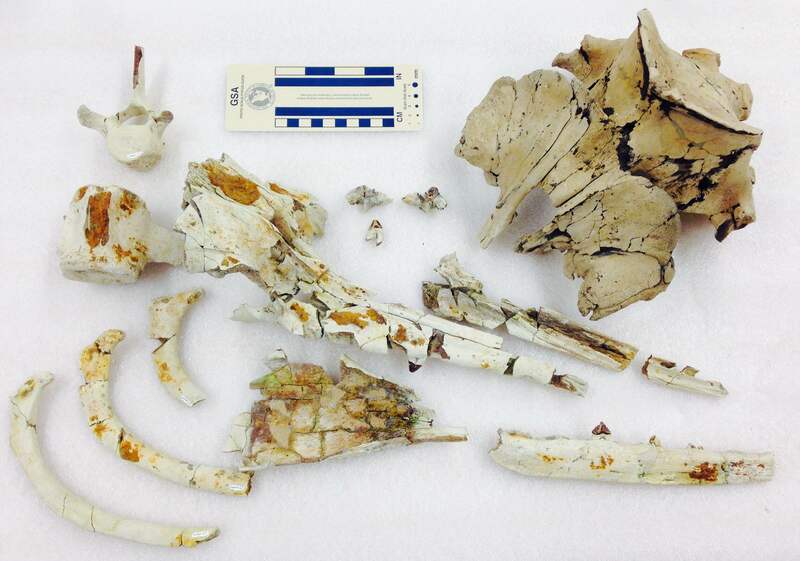 Several bones from the edge of a turtle shell – called marginals – record the presence of sea turtles, likely Syllomus aegyptiacus or Caretta, possibly Caretta patriciae, the two most common species from the Lee Creek Mine according to Zug (2001). Another fragmentary bone is identifiable as a parasphenoid bone – a bone located deep in the skull – of a billfish (swordfish and marlins). Sturgeons are represented by a fragment of dermal or skull bone with distinctive pitting – sturgeon are among the more common fish from the mine. The fourth non-cetacean is a proximal humerus fragment from some kind of large alcid bird – possibly Pinguinus alfrednewtoni, an extinct flightless penguin-like auk, and the fossil ‘ancestor’ of the recently extinct (ca. 1840s) Great Auk. More detailed comparisons with razorbills (genus Alca) are necessary. 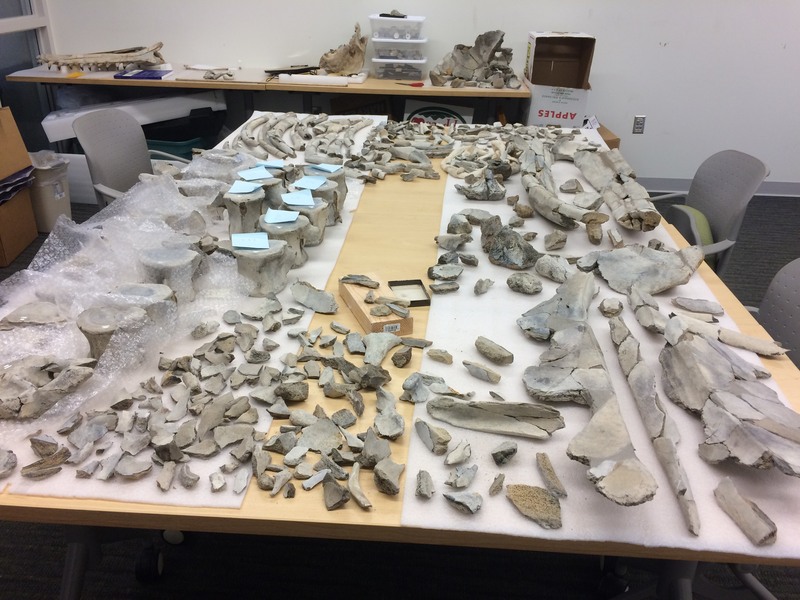 Shortly after Lee brought in the remaining parts of the skeleton, I made a surprising discovery – three additional squamosal bones of a much smaller cetacean. The squamosal is a paired skull bone, so there should only be two – not only does the skull of Lee’s whale have a squamosal, it’s also gigantic. So, there is a minimum of three cetaceans present (based on squamosals) – one large mysticete, and two smaller cetaceans. The smaller squamosals are identifiable as pygmy sperm whales (Kogiidae) based upon their size and shape. Shortly after I began noticing fragments of bone mixed in that were composed of a much finer porosity – individual pores in the bone were tiny and under half a millimeter rather than the much coarser pores in the mysticete. The bones are also much, much lighter, and a distinct difference in density was apparent. After an hour or so I had pulled out dozens and dozens of fragments – indicating that much of the skulls would come together. After about 5 or 6 hours of piecing, it is apparent that not only are there two individual pygmy sperm whales, but at least two genera present. One of these is similar to Aprixokogia kelloggi already reported from the Yorktown Formation (Whitmore and Kaltenbach, 2008), but also a second smaller taxon that appears closer to Scaphokogia cochlearis from the upper Miocene of Peru – though incomplete, the second skull has a more elongate rostrum than other kogiids. Sperm whales in general are freaky – they have highly asymmetrical skulls, and pygmy sperm whales are even weirder, completely lacking nasal bones. Scaphokogia has a bizarre elongate rostrum that makes other kogiids look well-adjusted and normal odontocetes. The first part of the skull I saw was the well-preserved earbones – and I saw this gorgeous little petrosal with attached posterior process and an associated bulla, and remarked “ooh it’s a minke whale!” The earbones are the same taxon which was identified earlier by Whitmore and Kaltenbach (2008) as Balaenoptera sp., cf. B. acutorostrata – something close to the modern minke whale. He then showed me a second petrosal, which I thought was a gray whale and not associated with the skeleton. Later on, I flipped the braincase over and the posterior process was in place still – and much, much larger than the minke whale petrosal. Instead, the gray whale petrosal fit in right in place. 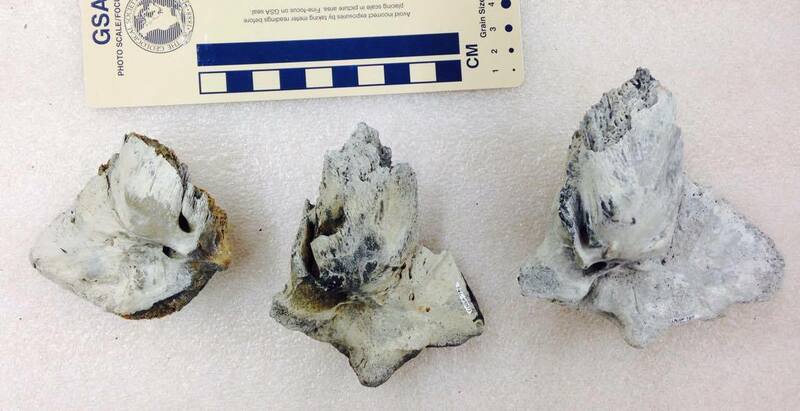 This meant that based on earbones, at least two baleen whales were present in Lee’s assemblage! The plot thickened yet again when I started looking at vertebrae, because various smaller vertebrae are mixed in to the assemblage. 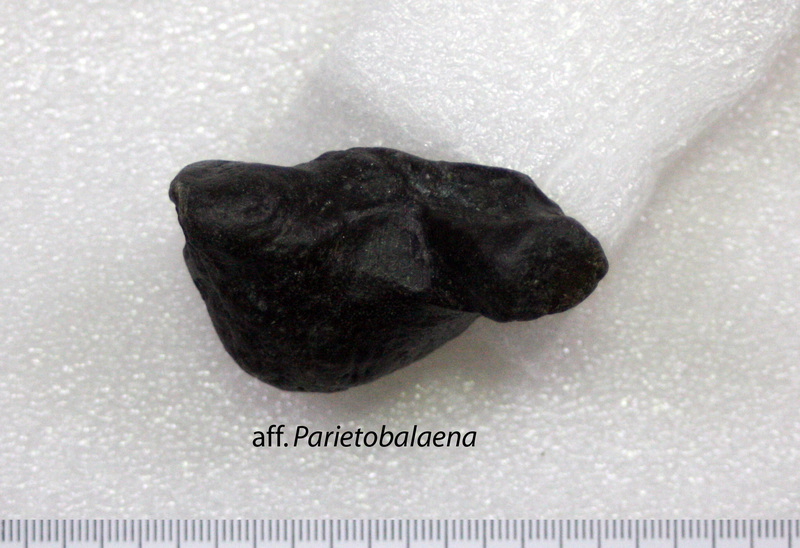 A second atlas and axis are present – and are much smaller, possibly representing the same Balaenoptera individual. Unfortunately, the atlas is much larger than the axis, and they do not fit together – meaning that there is a minimum of three baleen whales based on vertebrae! In sum, at least one sea turtle, one bird, two types of fish, two pygmy sperm whales, and three baleen whales are preserved in Lee’s assemblage. How could all this get deposited in the same spot? 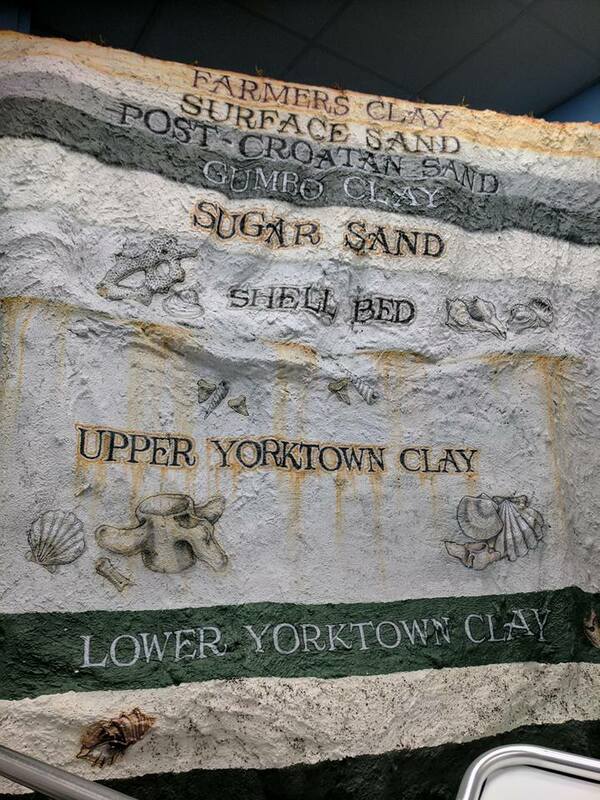 The Yorktown Formation is characterized by slow sedimentation rates, and is punctuated by several internal bonebeds formed during periods of slow or non-deposition. Slow deposition need not rearrange skeletal assemblages to the point of completely mixing them, but hundreds or thousands or hundreds of thousands of years may have passed with the deposition of only a single meter of sediment – enough to keep the main skeleton’s bones together, but providing ample time to preserve additional specimens vertically near the horizon of the skeleton. This is called a “condensed section” in stratigraphy. Secondly, all of this went through a dragline and was dumped – so the skeleton shifted somewhat, requiring much piecing together, but the skull and jaws and vertebrae were sort of close to anatomical position. 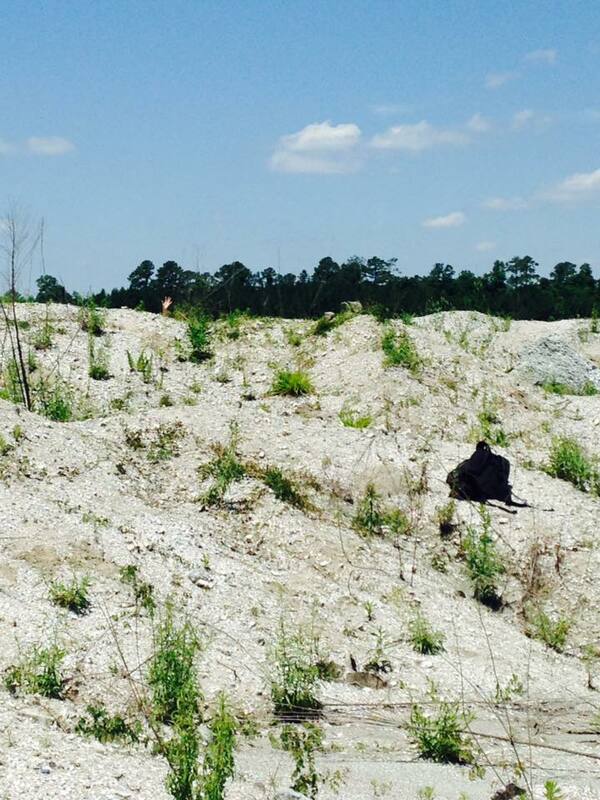 It’s therefore possible that mining operations may have mixed in material as well. Regardless of the process by which these remains were concentrated – geological or anthropogenic – we truly received a gift that has kept on giving. Once again, Thanks Lee! Happy Fossil Friday! 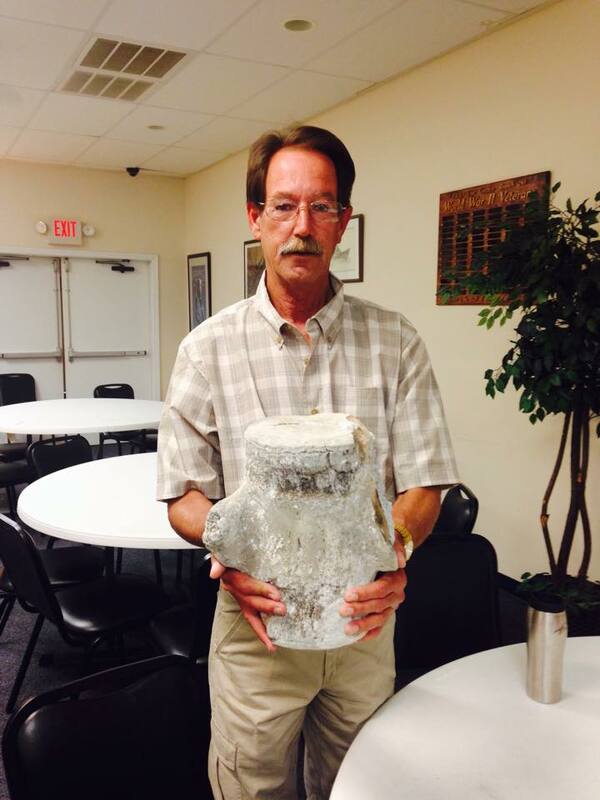 We’re back after a long hiatus, to talk about our most recent donation – A new gray whale from the Lee Creek Mine, NC, donated by Lee Cone. The PCS phosphate mine (aka Lee Creek Mine) near Aurora, North Carolina, preserves one of the largest and most diverse assemblages of fossil marine vertebrates anywhere on earth. The marine mammal assemblage is similarly one of the world’s more important assemblages – up there with Sharktooth Hill (California, USA), the Pisco Formation (Peru), Waitaki Valley (Oligocene, NZ), Calvert Cliffs (Maryland, USA), and the Oligocene Ashley/Chandler Bridge formations right here in Charleston. 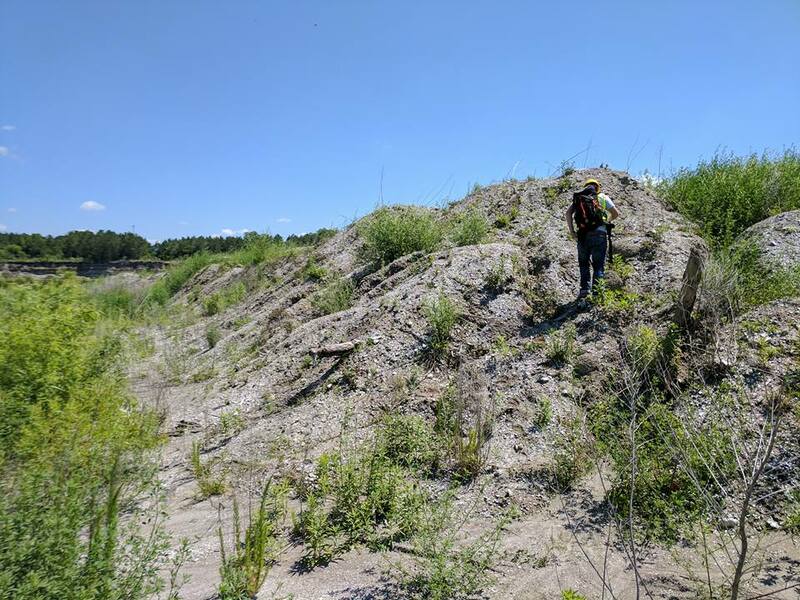 The richly fossiliferous Pungo River Limestone (Oligo-Miocene) is overlain by the Pliocene Yorktown Formation; the Pungo is highly phosphatic, and is the major ore-bearing unit at the phosphate mine (the base of the Yorktown is also targeted). During these mining operations, embarrassingly rich assortments of fossils are unearthed. Shark teeth, fish bones, and bird bones are often preserved hole – but the destructive mining process tends to separate associated skeletons and break bones up into smaller pieces. Sharks, fish, and birds are often identifiable based on isolated bones – but cetaceans (whales and dolphins) are generally not, with the exception of earbones, skull parts, and jaws. Whale and dolphin earbones are commonly found in both of the major units in the Lee Creek Mine, and tend to survive mining activities. Earbones are highly distinctive and easy for paleocetologists to identify – but when isolated, do nothing more than act as a register of a particular species at a particular place and time in earth’s history. More complete remains are generally needed to name new species and examine their evolutionary history. 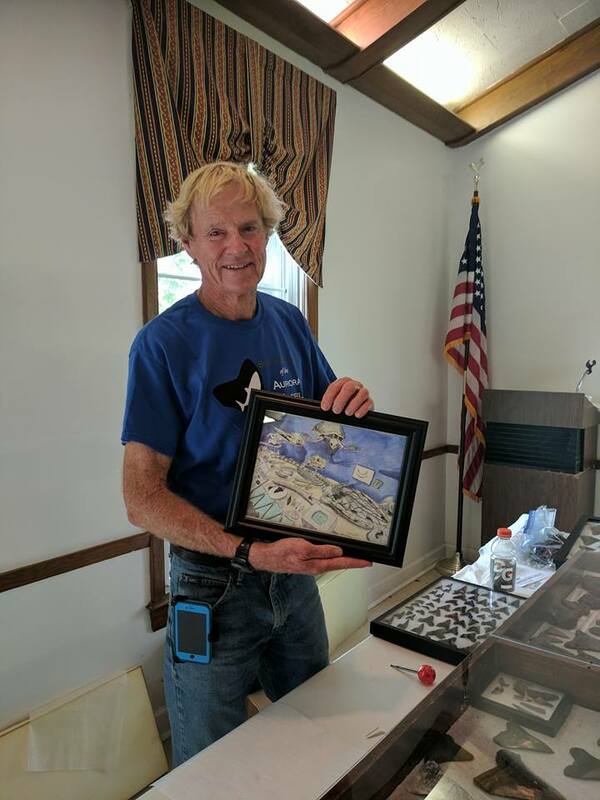 President of the Special Friends of the Aurora Museum and fossil collector extraordinaire Lee Cone just donated to CCNHM a spectacular whale skeleton he collected over several weeks in 2006 prior to closure of the mine. The skeleton had gone through a dragline but dumped with skull, jaw, and postcranial remains in near-correct position. Though fragmented, Lee was able to piece back together quite a lot of the specimen. It includes a partial skull, earbones, mandibles, vertebrae, and ribs (and perhaps other postcrania). Skeletons like this are extremely rare at the mine – visitors often only have a single morning to collect, and mining operations tend to destroy skeletons like this. In fact, even skulls and skull parts are rare; nearly every partial skull from the mine has either been named, described, or designated as a holotype specimen. Associated marine mammal skeletons – and baleen whales at that – are almost unheard of. The baleen whale assemblage from the Pliocene Yorktown Formation includes a dwarf right whale (Balaenula sp. ), a bowhead whale (Balaena ricei), a minke whale-like species (Balaenoptera sp., cf. B. acutorostrata), an extinct and very poorly known larger rorqual (“Balaenoptera borealina”), a possible humpback whale (Megaptera sp. ), a gray whale (Gricetoides aurorae), and two dwarf cetotheriid baleen whales (Herpetocetus transatlanticus, Herpetocetinae n. g.). 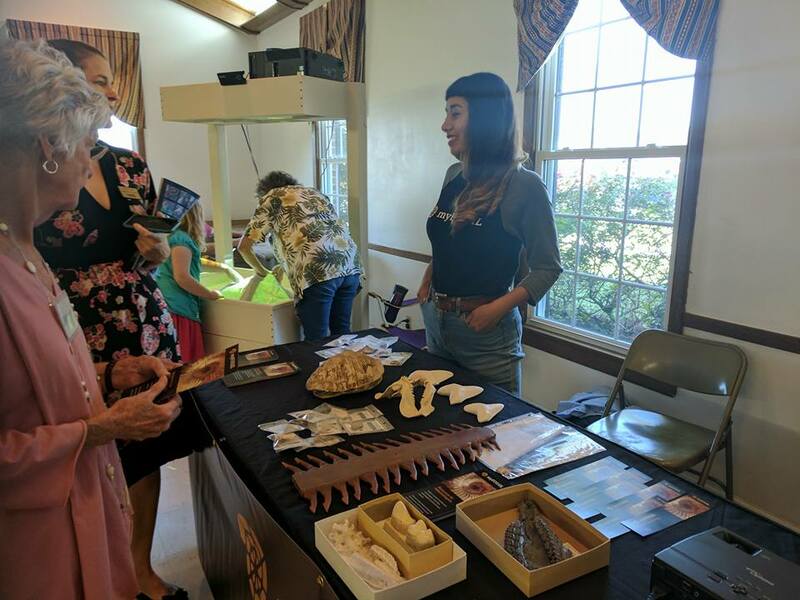 A recent donation to CCNHM from the estate of Rita McDaniel, an avid collector who amassed a spectacular collection of fossils from the mine, includes 16,000 specimens with hundreds upon hundreds of whale and dolphin earbones. 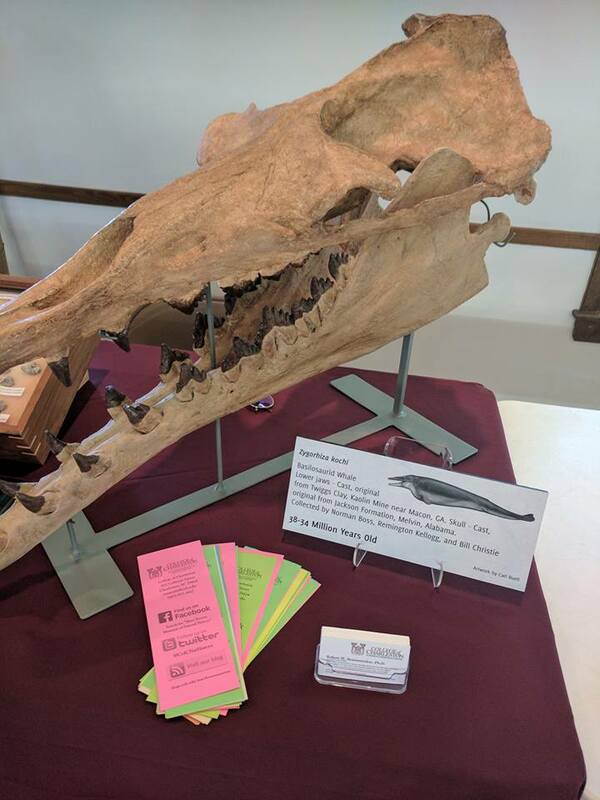 This collection indicates the presence of at least one or two additional baleen whales – including a second gray whale, an undetermined genus that is perhaps closer to the modern gray whale (Eschrichtius robustus) than Gricetoides is. Before Lee Cone brought the specimen to CCNHM, I knew that because most of these species are represented only by material far less complete, the odds were good that the specimen would be highly significant and either 1) represent a name-able species or new genus and species, or 2) represent a publishable specimen expanding the known morphology of a pre-existing species (e.g. Gricetoides). 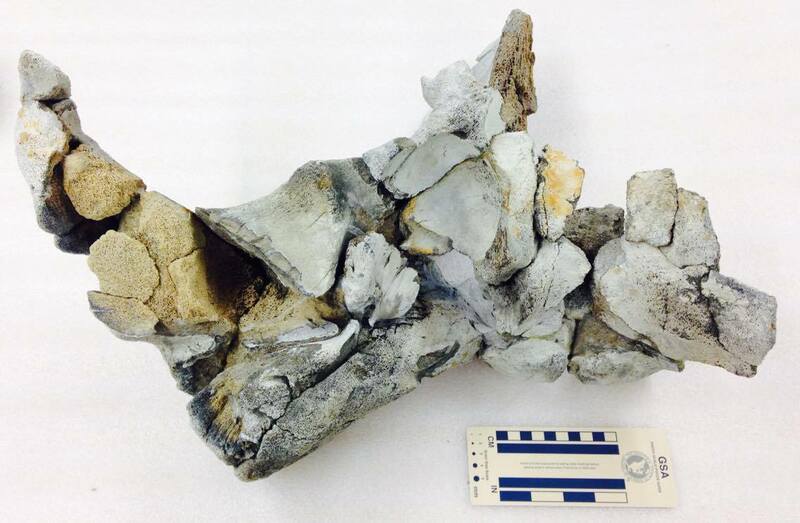 As it turns out, this specimen shares the unique earbone morphology of the second gray whale from the McDaniel Collection – and differs in some ways from Gricetoides, confirming the presence of two gray whales in the Yorktown Formation. 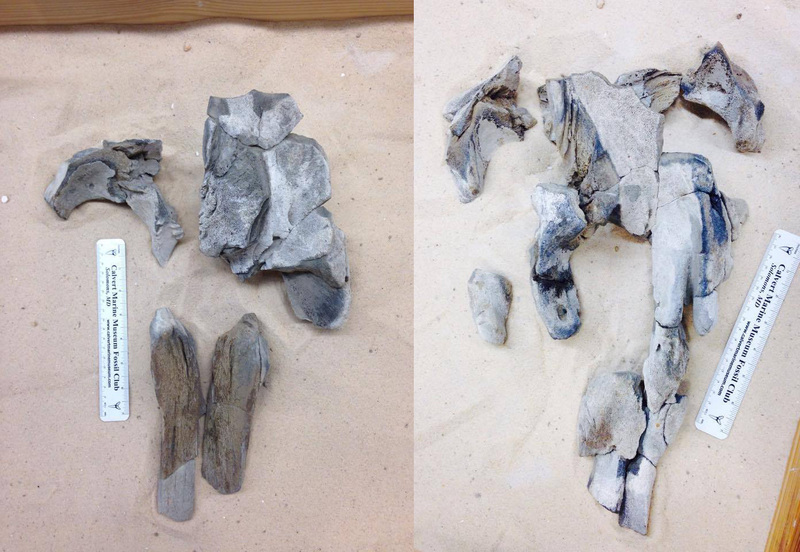 Lee’s whale looks to be a future holotype specimen, representing either a new species or a new genus as well! Echovenator sandersi, the Echo Hunter. Image Source. We all know that odontocetes (toothed whales and dolphins) use echolocation – this bio-sonar allows them to find their way under water and hunt their prey. They send a series of ‘pings’ out and listen for the echo with specialized organs and facial structures that allow them to be successful predators, and even differentiate shapes! 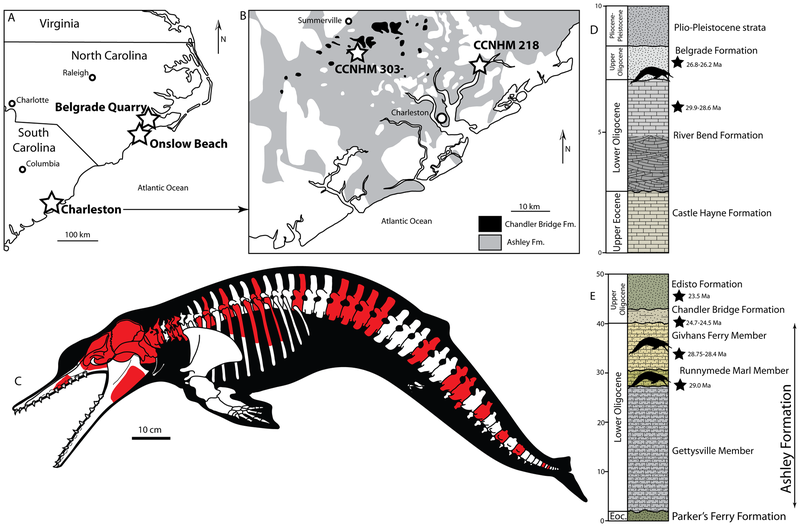 Recently, a new paper was published describing a fossil dolphin from the Charleston area that supports an earlier origin than previously thought for ultrasonic hearing & echolocation in toothed whales. This dolphin, named Echovenator sandersi, is a xenorophid dolphin from the Chandler Bridge Formation, which is late Oligocene in age (26-23 million years old). Xenorophidae are the oldest and most primitive known group of Odontoceti; they have an anteriorly placed blowhole/melon, heterodont teeth, and a mostly symmetrical skull and also large brain size. Other fossils like Cotylocara macei (CCNHM collections) demonstrate that xenorophids already had ability to produce sounds for echolocation, owing to a series of unique sinuses and other structures in the facial region of the skull. In a separate recently published paper, a single xenorophid periotic (inner earbone) was recently analyzed using micro-CT (computed tomography) and found capable of hearing ultrasonic frequency sounds; however, identification of this periotic is unclear and not associated with a skull. Echovenator preserves earbones with loosely coiled cochlea and other features indicative of ultrasonic hearing as in modern Odontoceti. 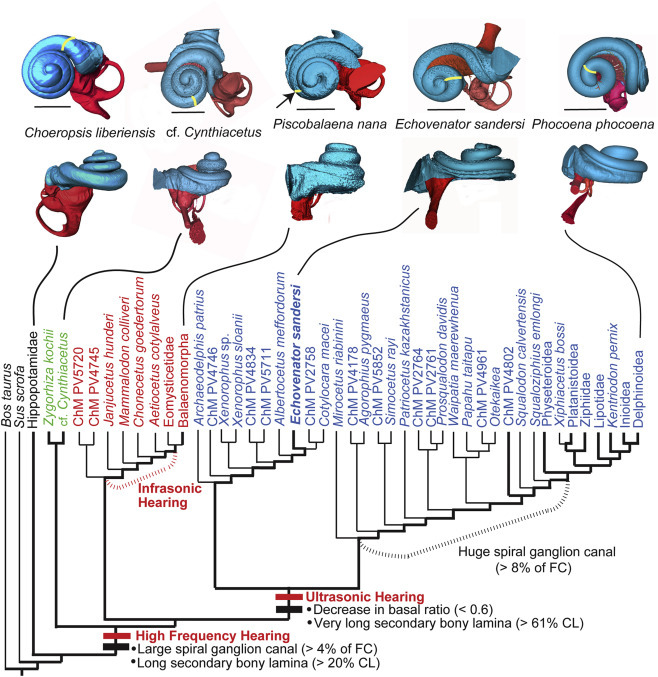 New analysis suggests that high frequency hearing is the primitive condition for all cetaceans, and that baleen whales (Mysticeti) and odontocetes diverged early from this ancestral condition, with baleen whales evolving low frequency hearing and toothed whales evolving ultrasonic hearing. Phylogenetic tree demonstrating the evolution of cetacean hearing. Two skulls in CCNHM collections also represent Echovenator, and are either juveniles or perhaps a second species in the newly described genus. 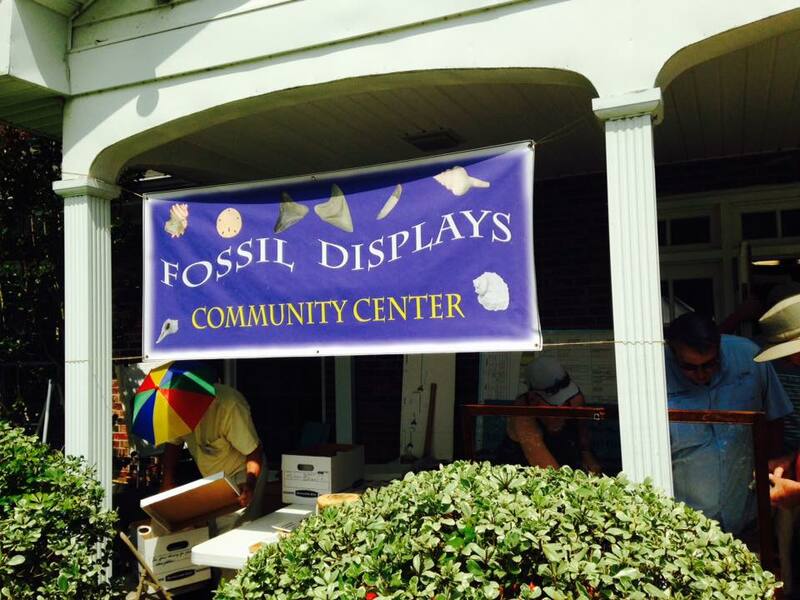 Friday Fossil Feature – An Over-Whale-Ming Donation! 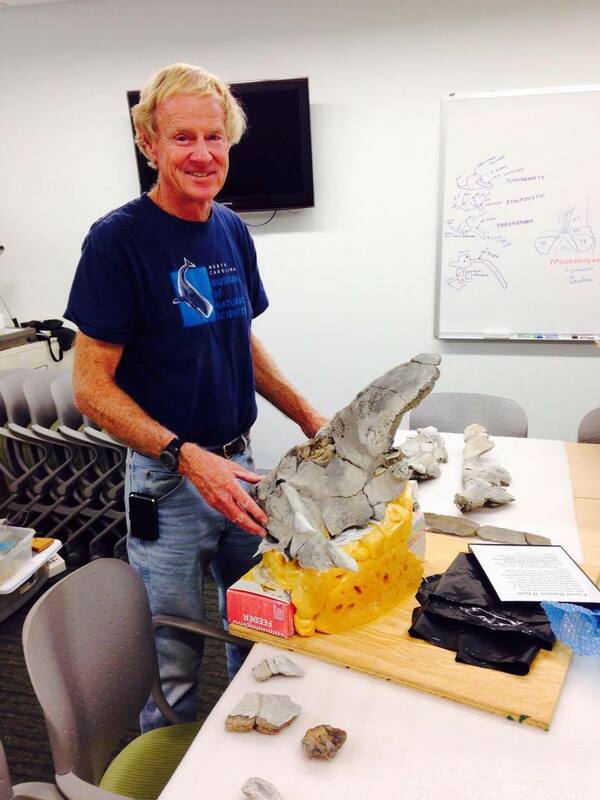 Mark with his gigantic Basilosaurus vert – kindly donated to the CCNHM! Photo by R. Boessenecker. 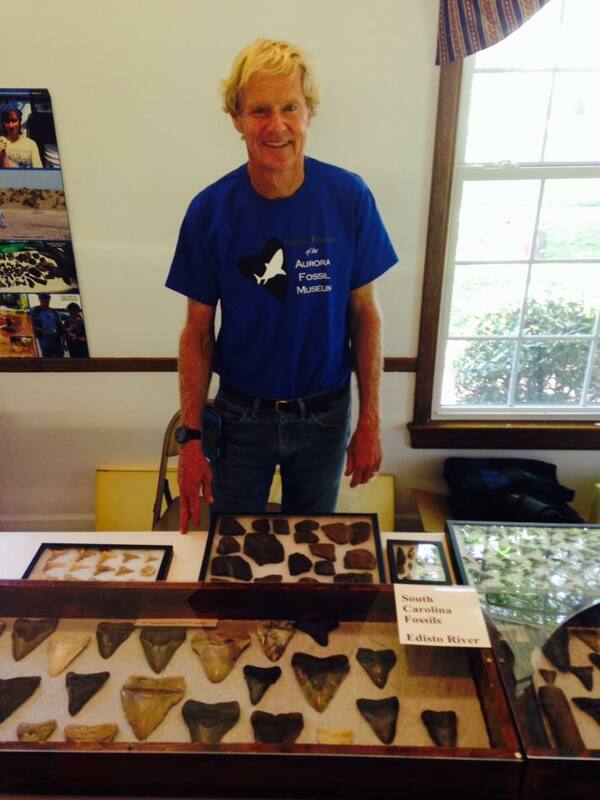 Today we’re writing to thank local fossil collector, and founder of the Palmetto Paleontological Society, Mark Bunce. 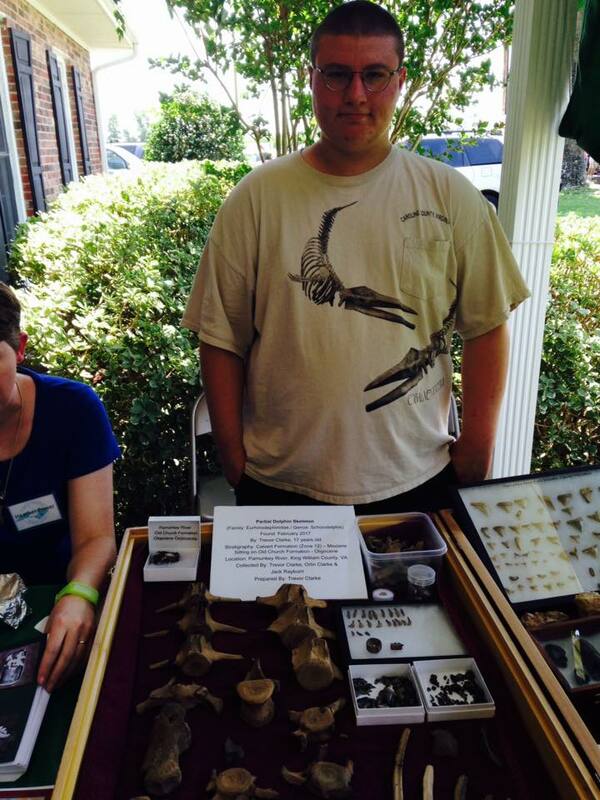 Mark has a passion for fossils, and started our local fossil club 2 years ago; over the years, Mark has made numerous donations to CCNHM, and many of these fossils are proudly on display. 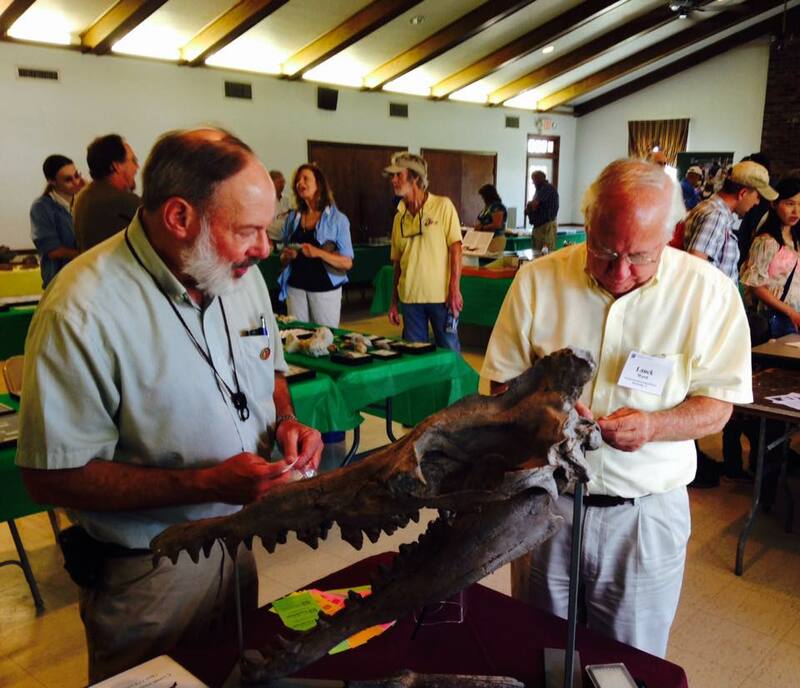 At the most recent meeting, he donated a large Basilosaurus sp. 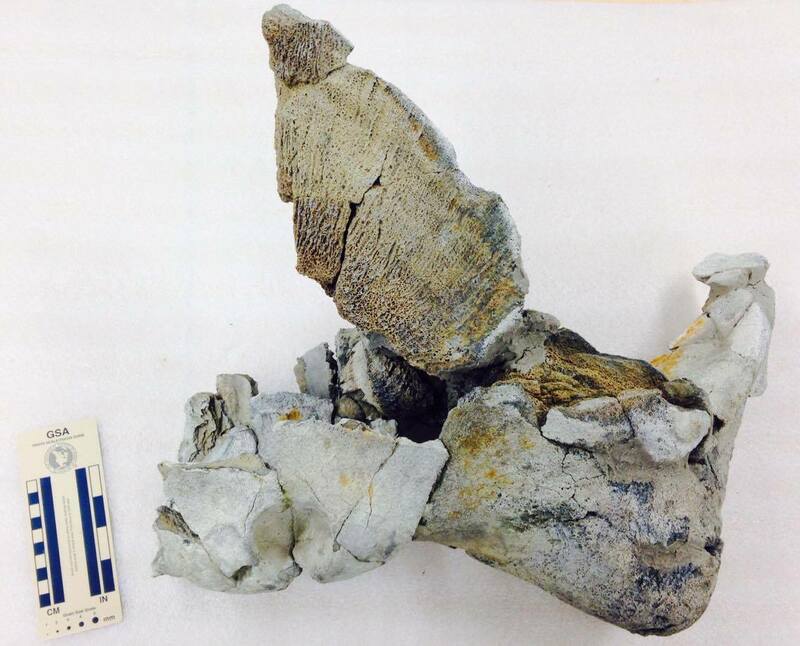 vertebrae – nearly 12 inches in length! Big vertebrae mean big animals! Photo from Wikimedia Commons. Basilosaurus was an early whale – one of the earliest! They lived in the Eocene, and grew to huge sizes. With over 70 vertebrae, Basilosaurs was over 50 feet long – making them a deadly predator of the late Eocene seas. Basilosaurus still retained hind limbs, though they were highly reduced and not capable of supporting weight on land; it was completely restricted to aquatic environments. Though it wasn’t as highly adapted to ocean life as whales of today, likely spending most of its time near the surface and hunting fish, sharks, and potentially other small whales, it had started to develop the features of modern cetaceans in its ear bones – they were separated from the skull with dense bullae, indicating it could hear directionally underwater. 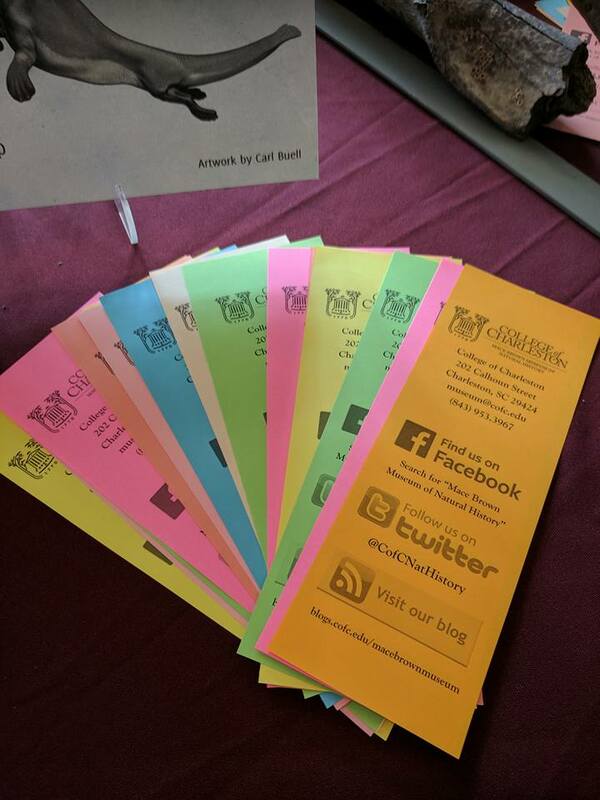 Museums such as CCNHM are made possible through the donations and help of amateur collectors – over 80% of the material in collections and on display at CCNHM are from amateur collectors, most of them in the Charleston area! In fact, we have so much donated material we are busy working on a display case devoted entirely to amateur collectors and their donations. Thanks again, Mark, for the wonderful donation!